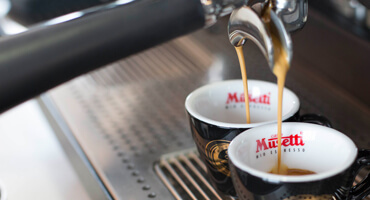 There is nothing better than enjoying a good coffee at home: it can give you the right boost in the morning, be your ritual after meals or a pleasant afternoon break. Ground coffees, pods and capsules: no matter what the form, the content is good coffee to be savored at home. 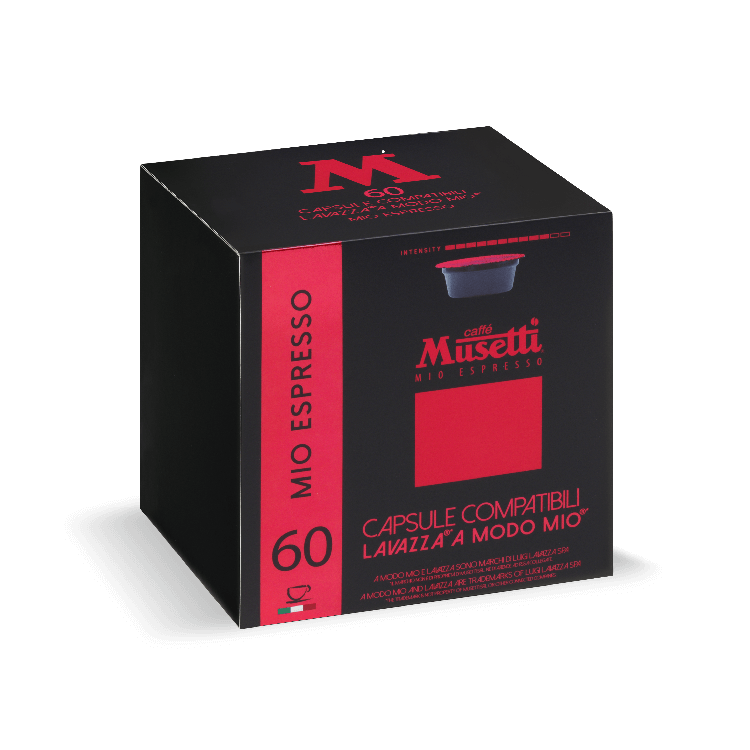 Many gadgets to enjoy coffee at home: moka pots, mugs, coffee cups, glasses and special collections that give a dash of style to your breaks. 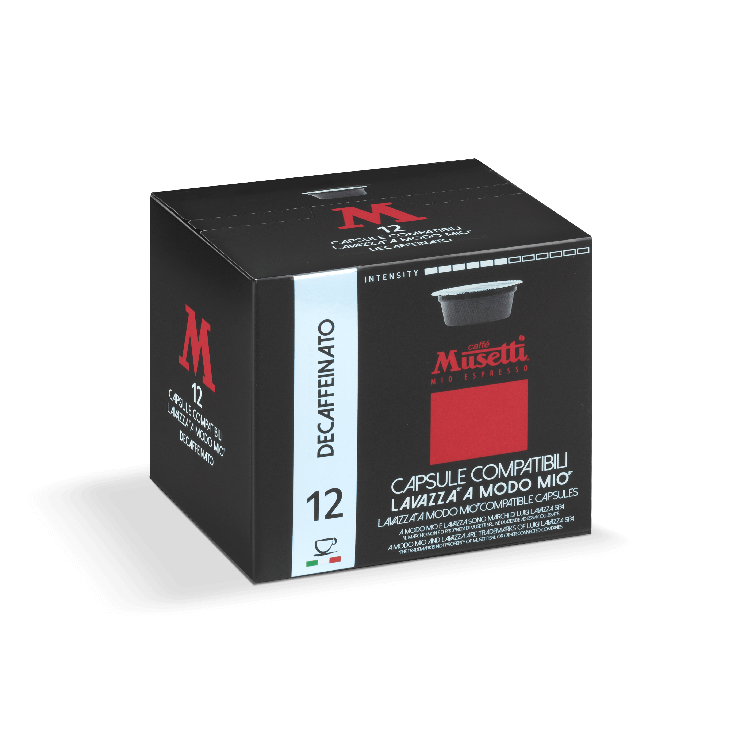 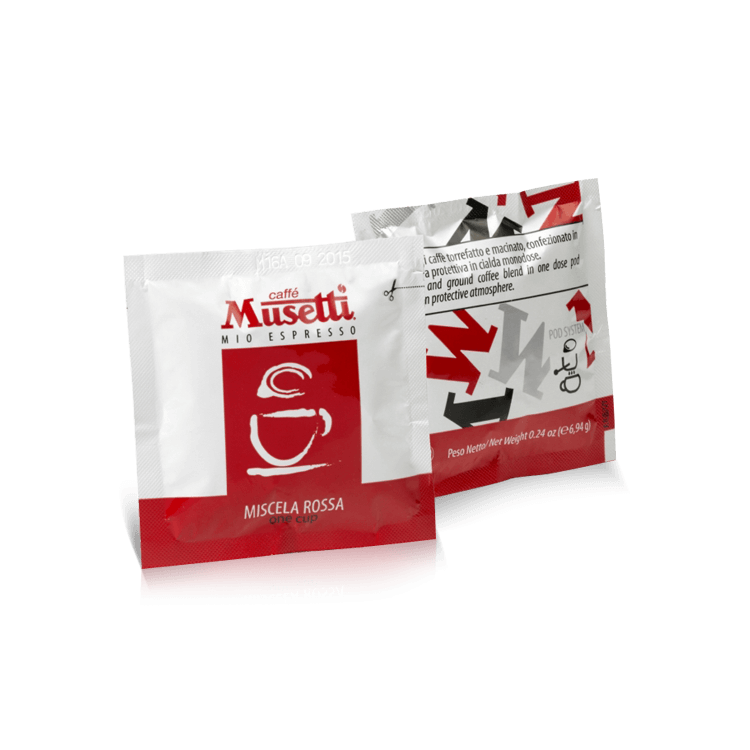 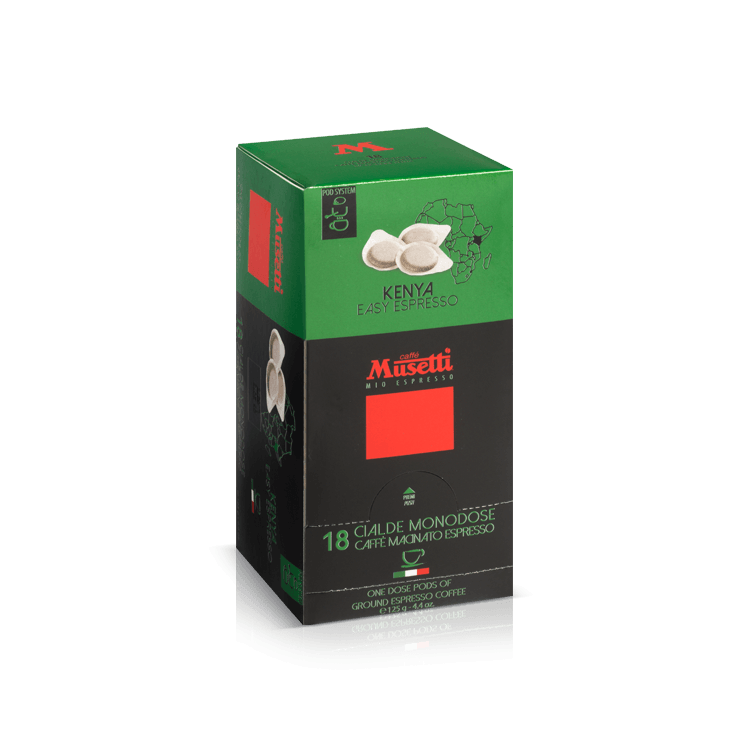 Musetti's experience also reaches the world of tea and chocolate, to offer a different break with the same quality as ever. 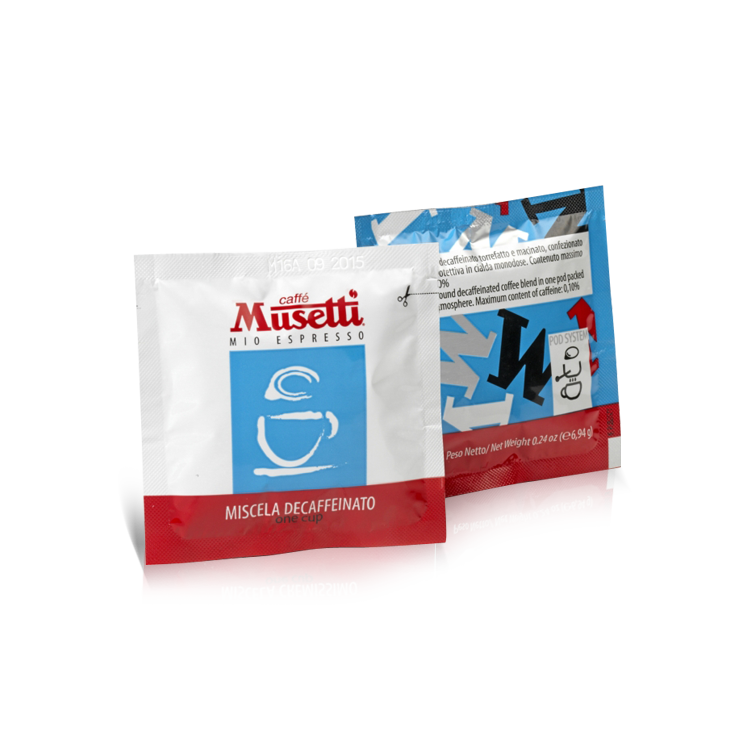 Surf the three worlds, "The Coffee", "Gadgets" and "Not Just Coffee", and discover all Musetti products for your coffee moments at home. 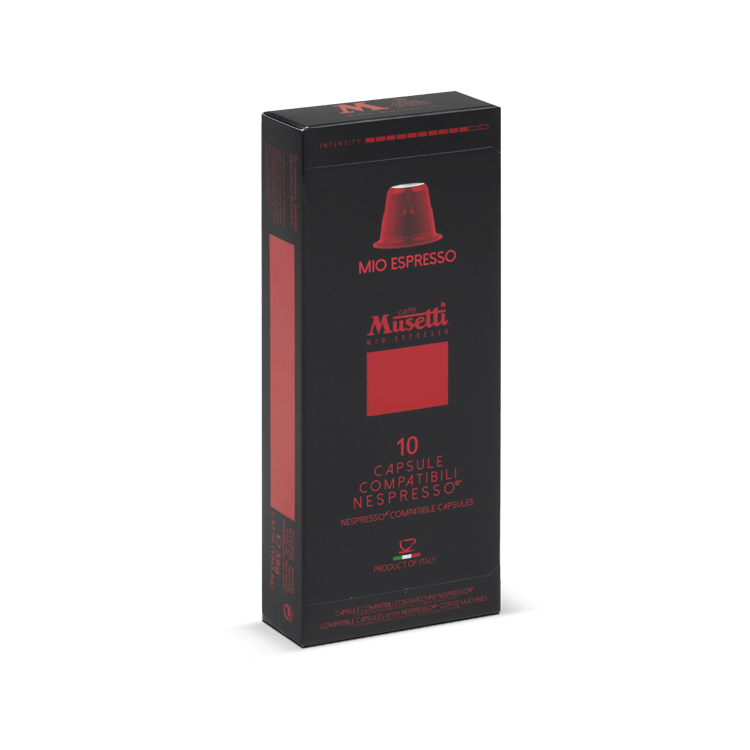 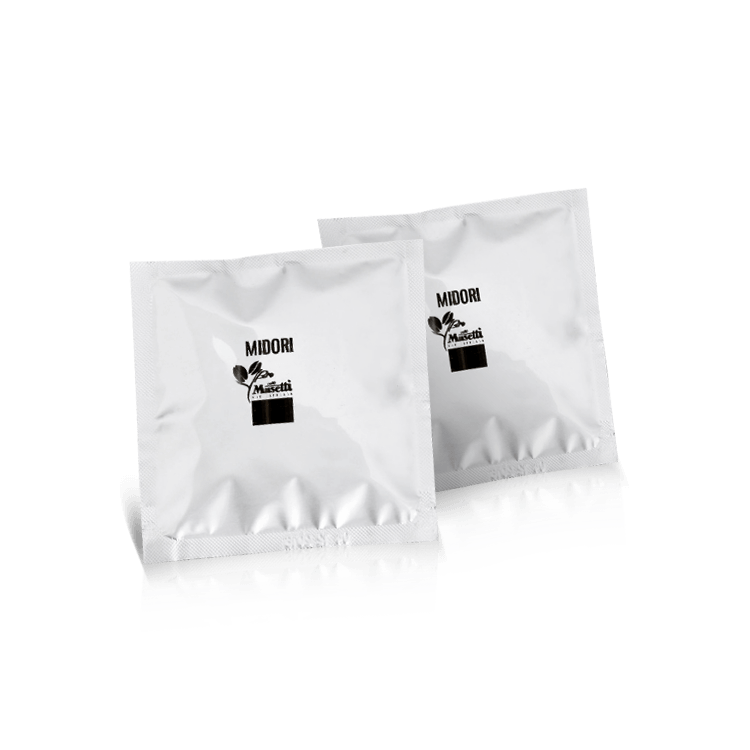 Mio Espresso coffee capsules, an evergreen blend with a harmonic, creamy and persistent taste. 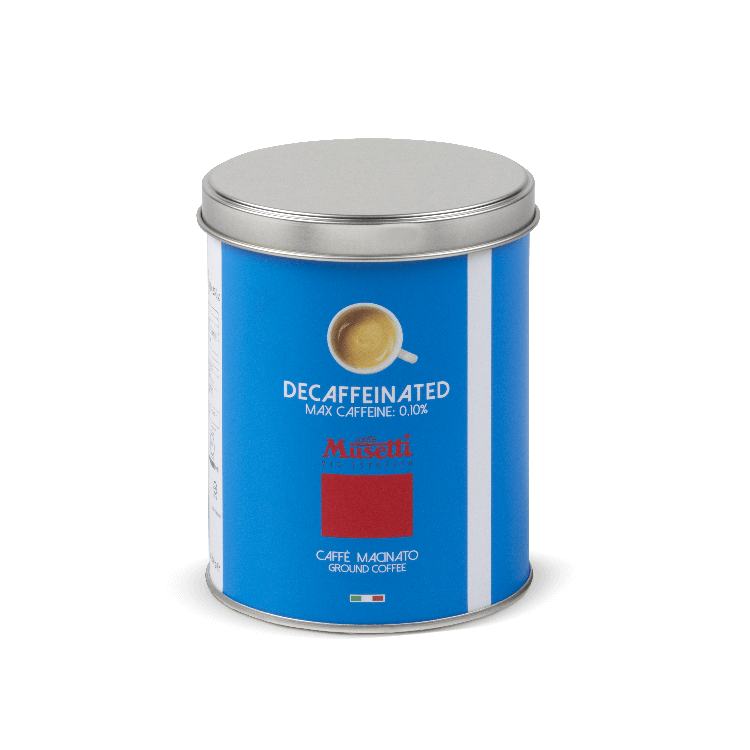 Decaffeinated coffee capsules, full-flavored coffee with less than 0,1% caffeine content. 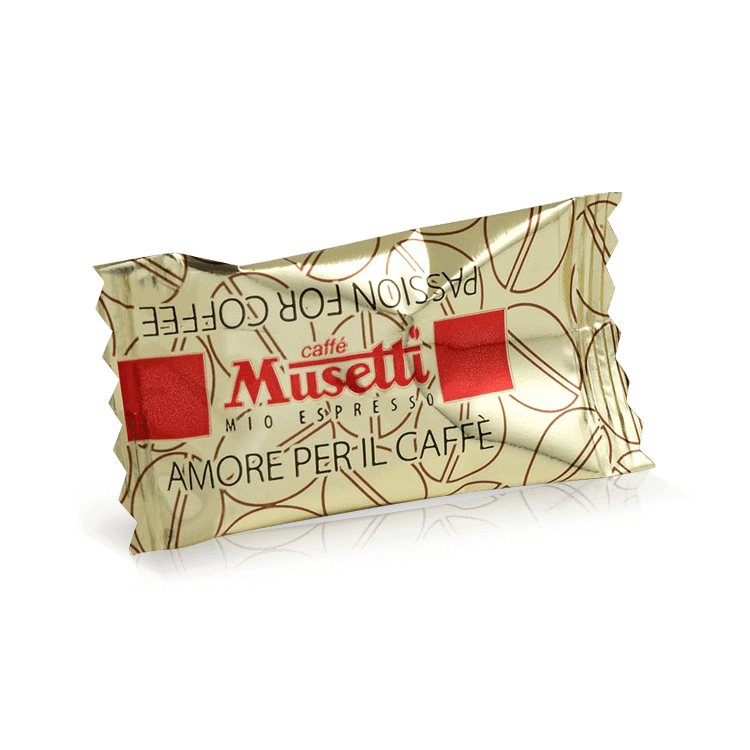 Sweet and light aroma. 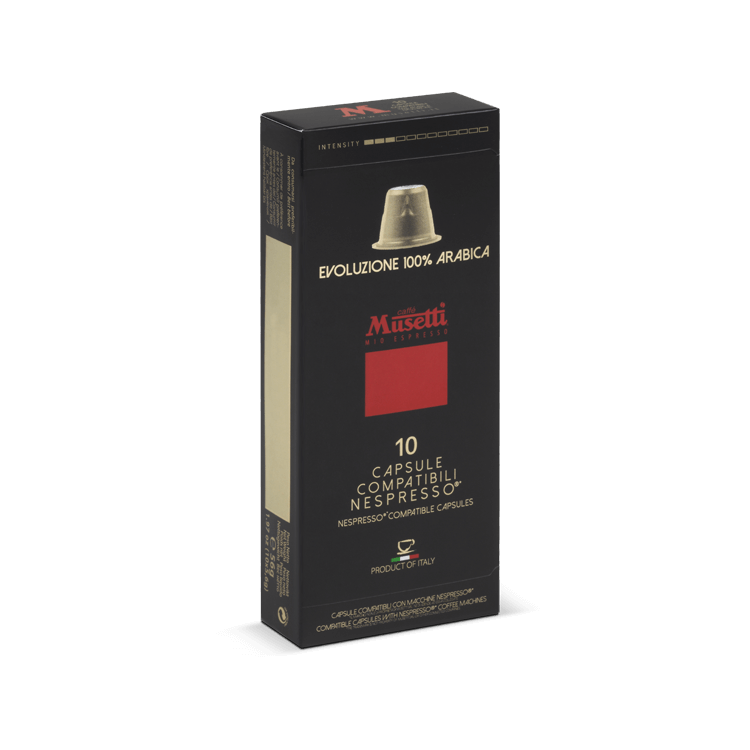 Evoluzione coffee capsules, a sweet and mild acid blend from 100% Arabica finest quality coffees. 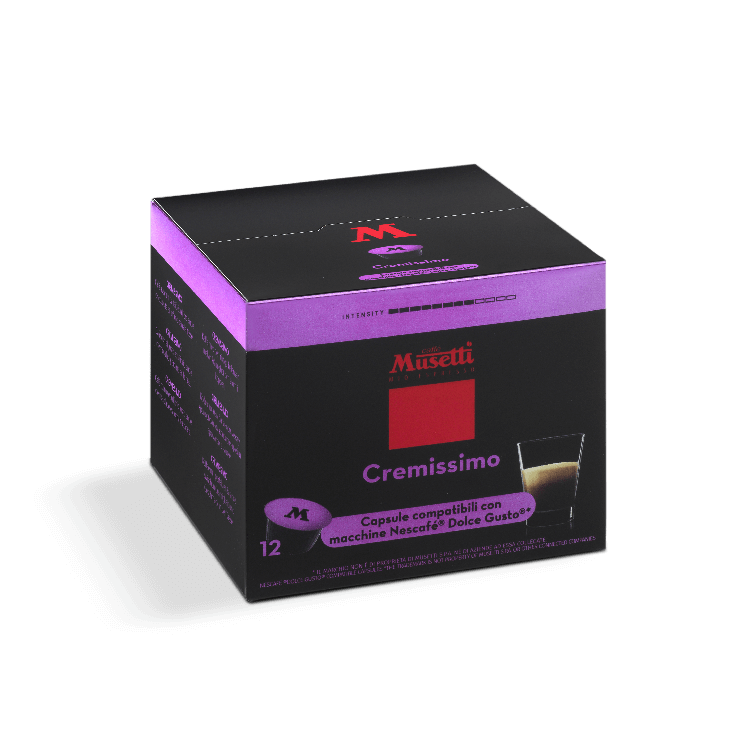 Cremissimo coffee capsules, a full-bodied and creamy blend with intense and balanced taste. Gold Cuvée capsules from finest quality coffees, a sweet, richly flavored and fine acid blend. 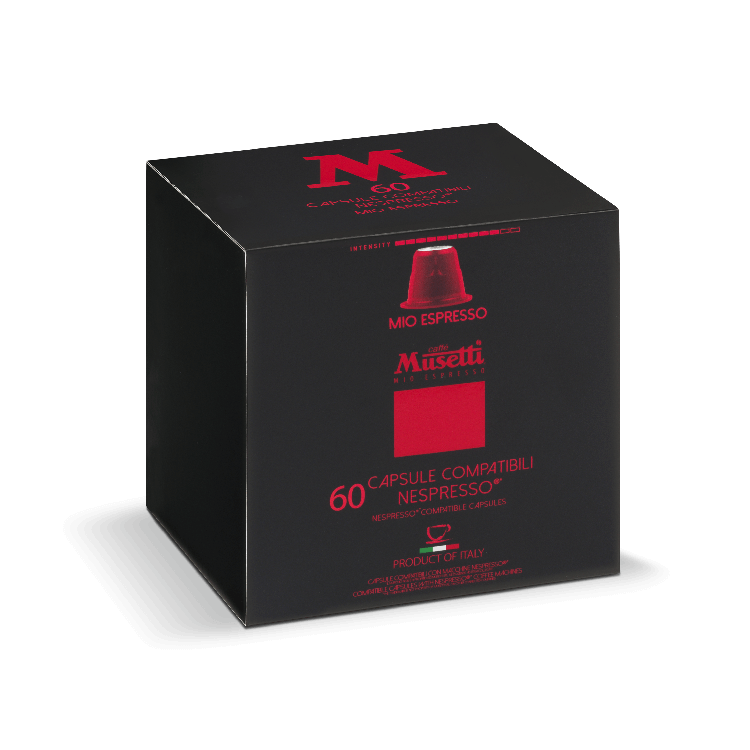 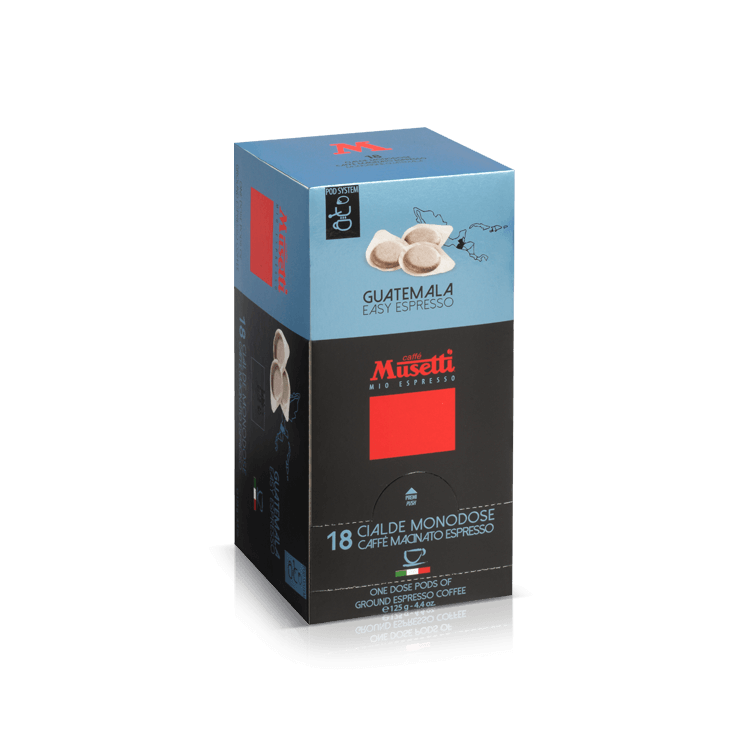 Grand Cru capsules, from Achille Musetti collection, a sweet and aromatic blend, refined taste. 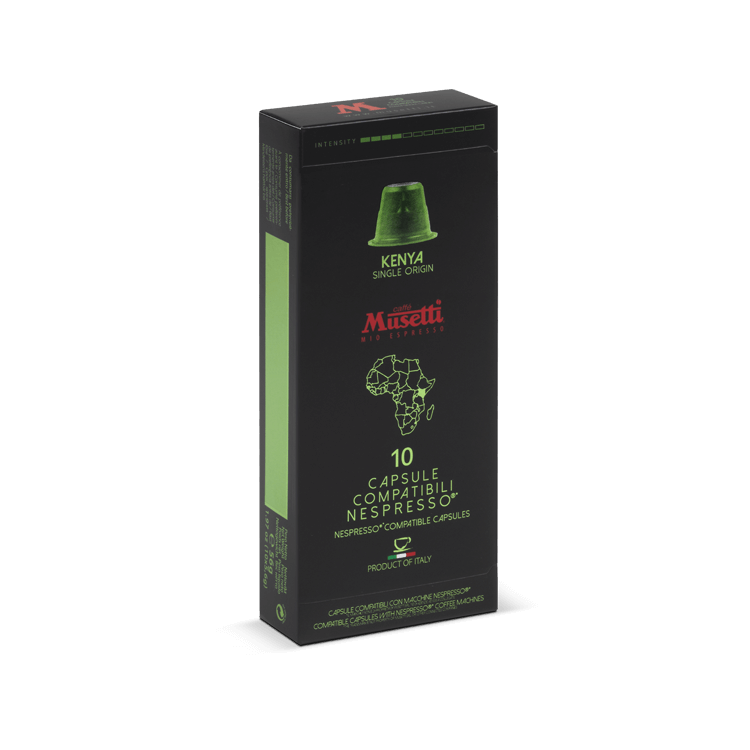 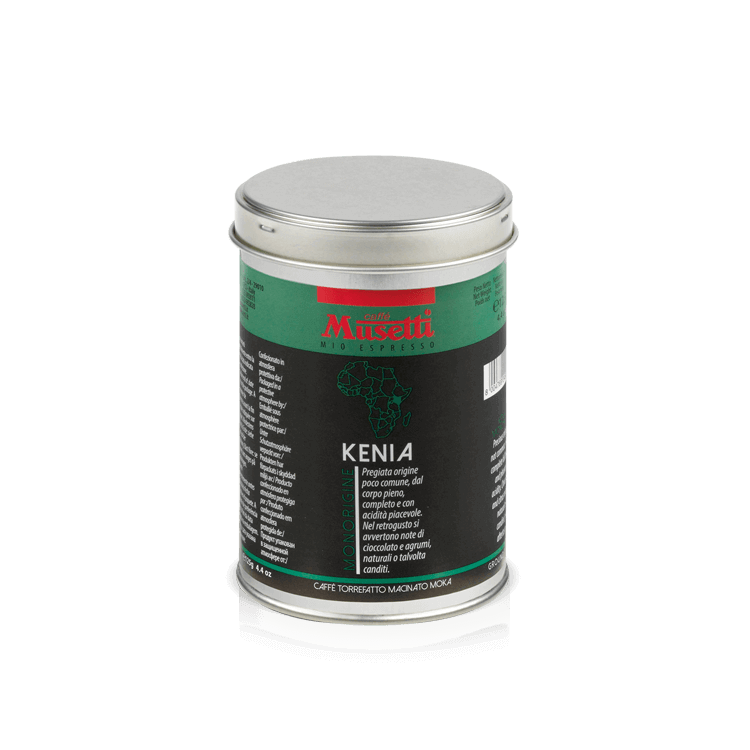 Kenya coffee capsules Single Origin, a high quality, full bodied and fine acid blend. 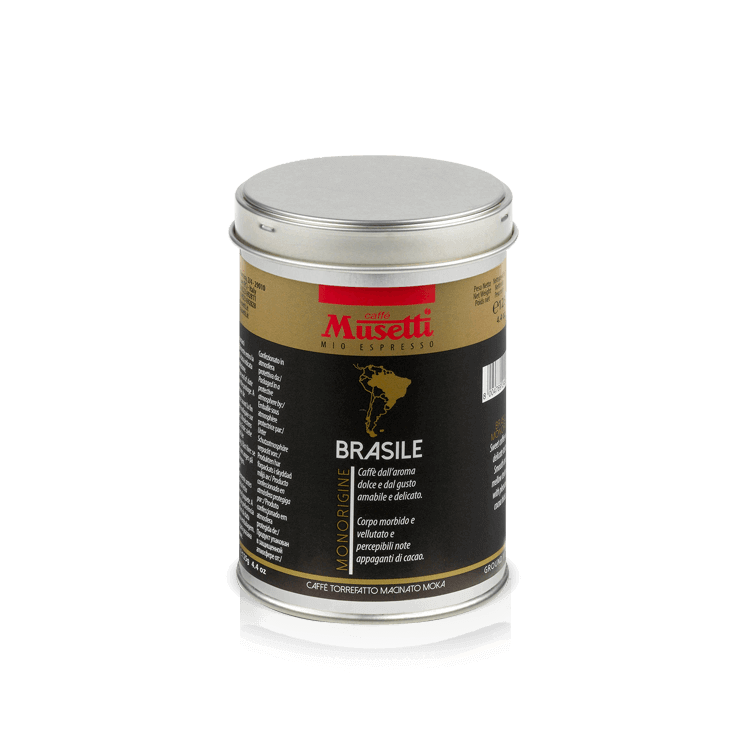 Brasile coffee capsules Single Origin, a full and velvet bodied blend with intense and consistent aroma. 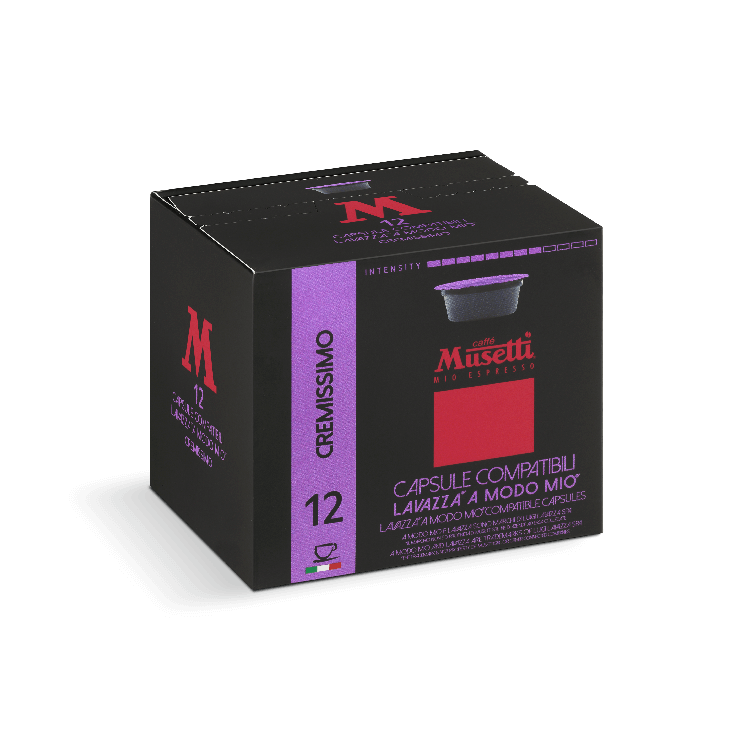 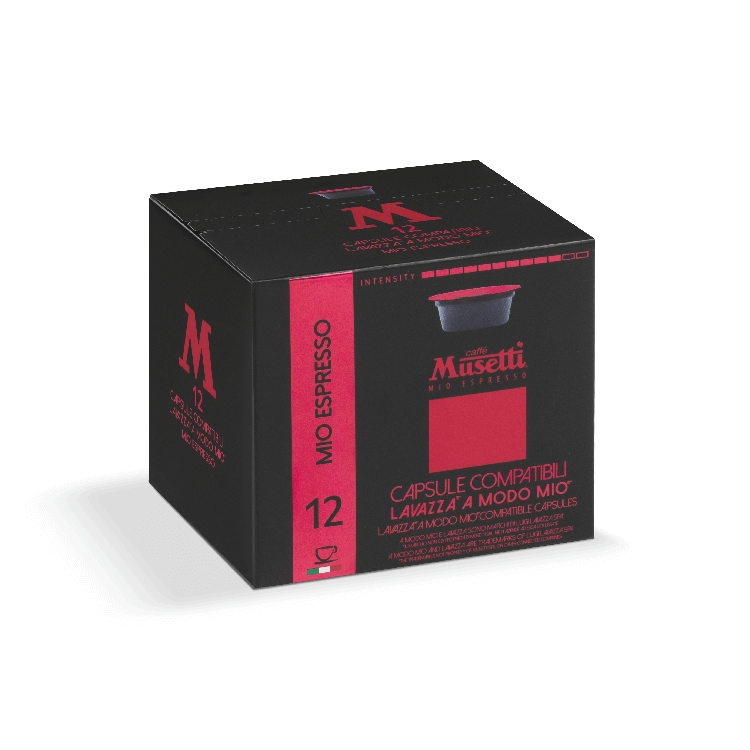 Guatemala coffee capsules Single Origin, a full bodied, sweet and aromatic flavored blend. 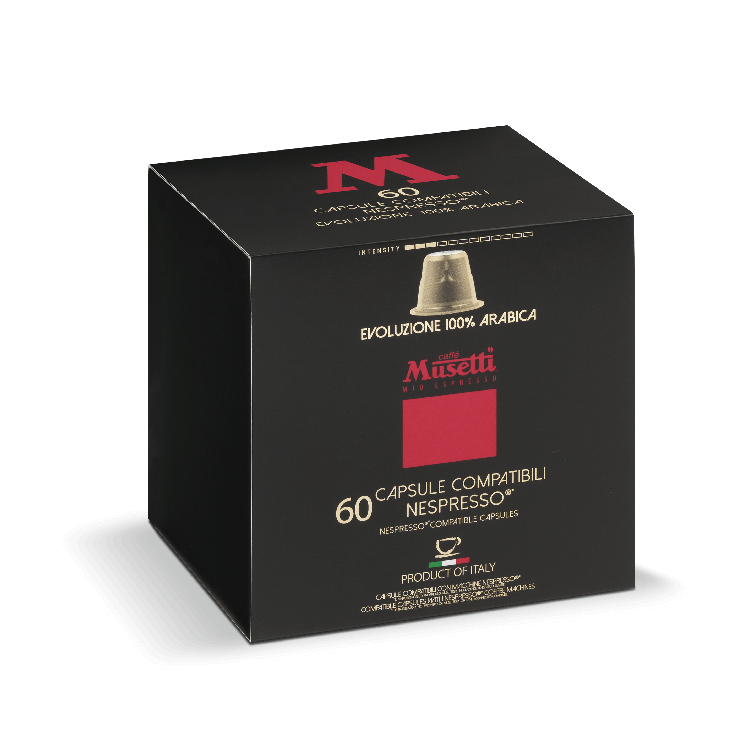 Ethiopia coffee capsules Single Origin, a grand cru blend with complex and highly intense aromas. 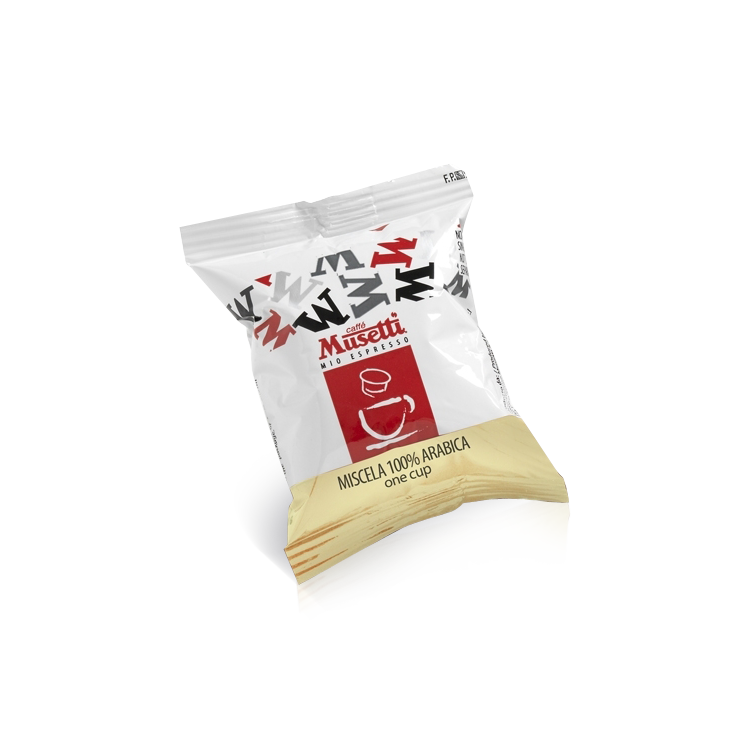 Kenya coffee pods Single Origin, a high quality, full bodied and fine acid blend. 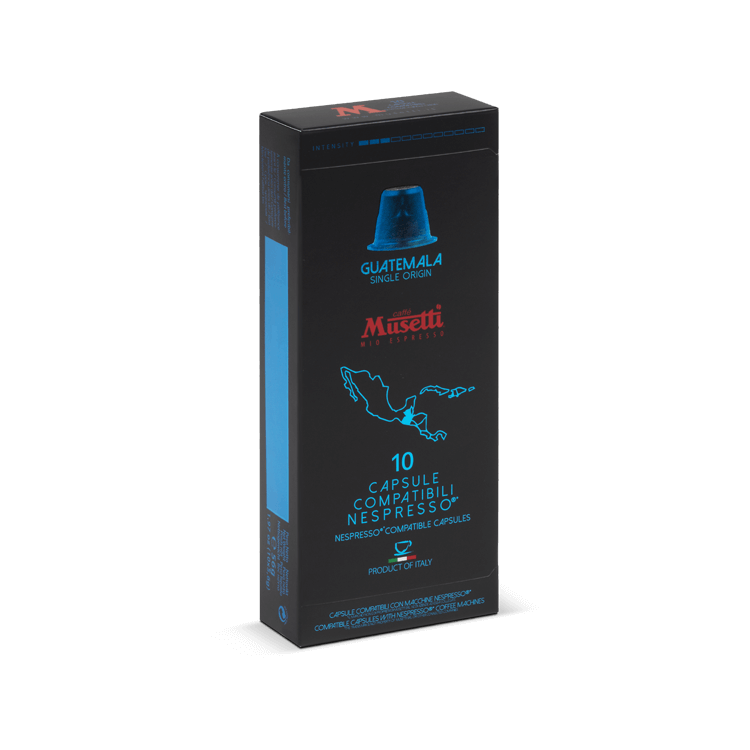 Guatemala coffee pods Single Origin, a full bodied, sweet and aromatic flavored blend. Ethiopia coffee pods Single Origin, a grand cru blend with complex and highly intense aromas. Brasile coffee pods Single Origin, a full and velvet bodied blend with intense and consistent aroma. 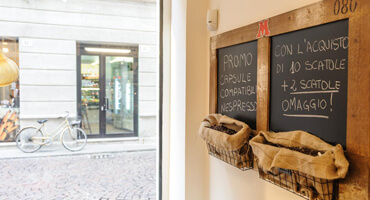 Paradiso coffee pods, a historic Musetti blend from Arabica quality coffees with a refined and pleasant taste. 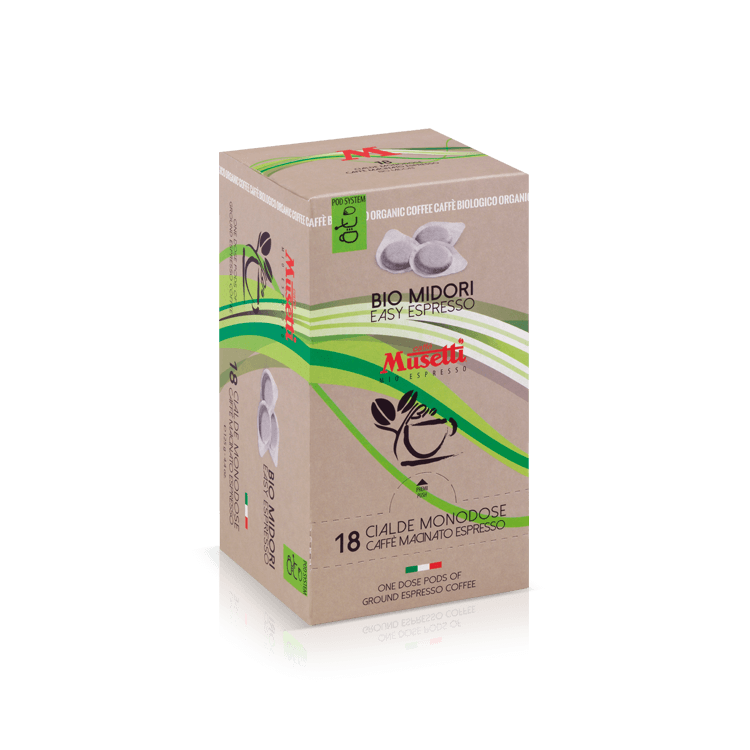 ‘Midori’ organic coffee pods, a sweet and smooth organic blend with fine acidity. 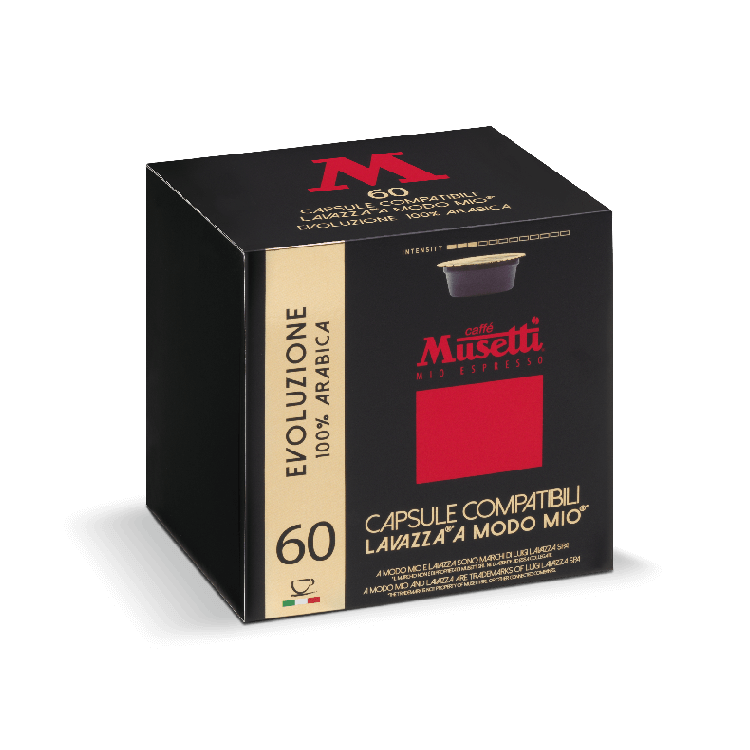 Evoluzione coffee pods, a sweet and mild acid blend from 100% Arabica finest quality coffees. 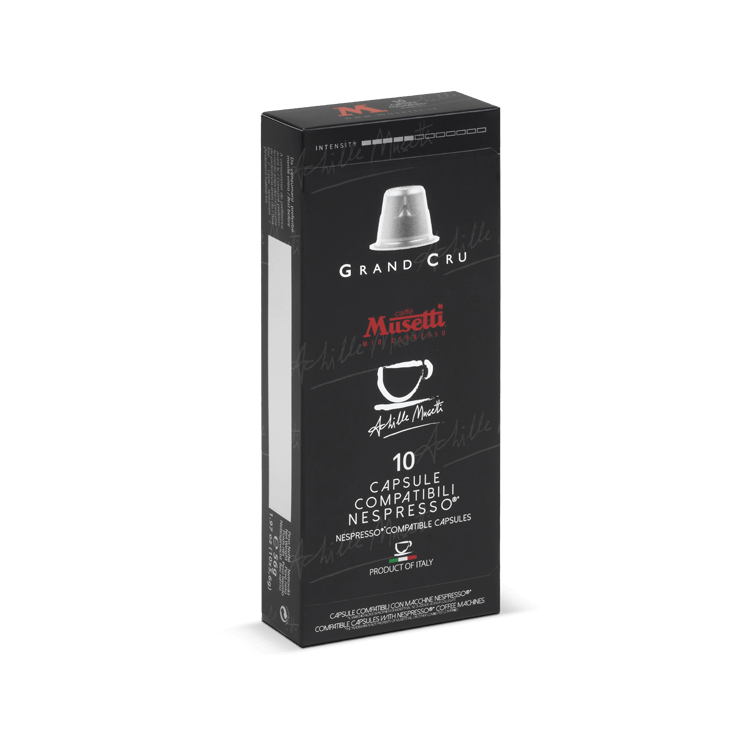 Grand Cru coffee Pods. 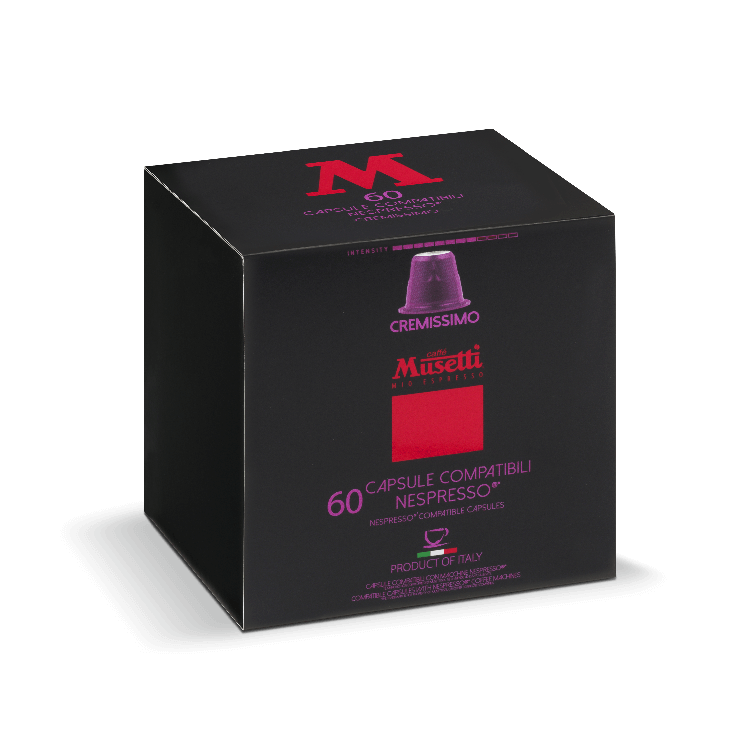 From Achille Musetti collection, a sweet and aromatic blend, refined taste. 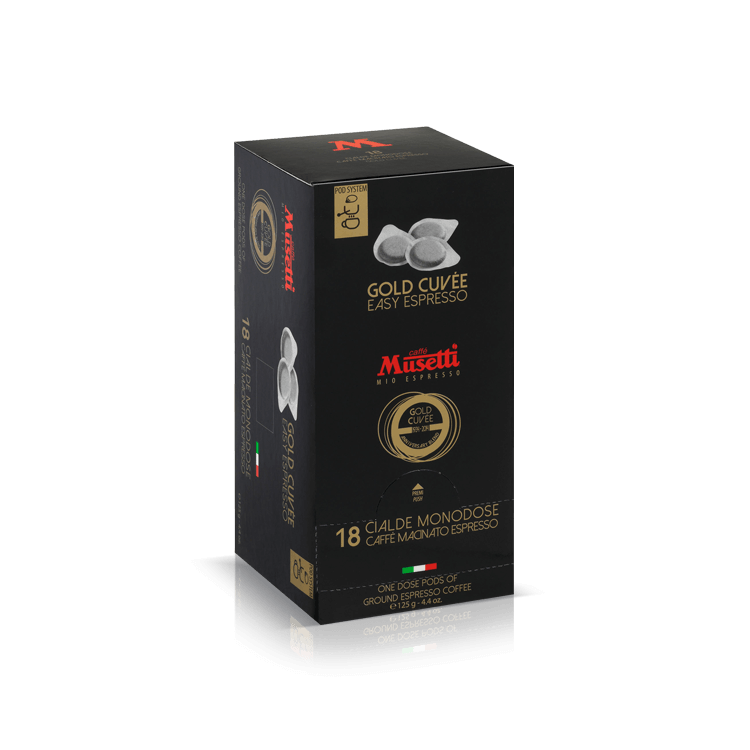 Gold Cuvée coffee Pods from finest quality coffees, a sweet, richly flavored and fine acid blend. 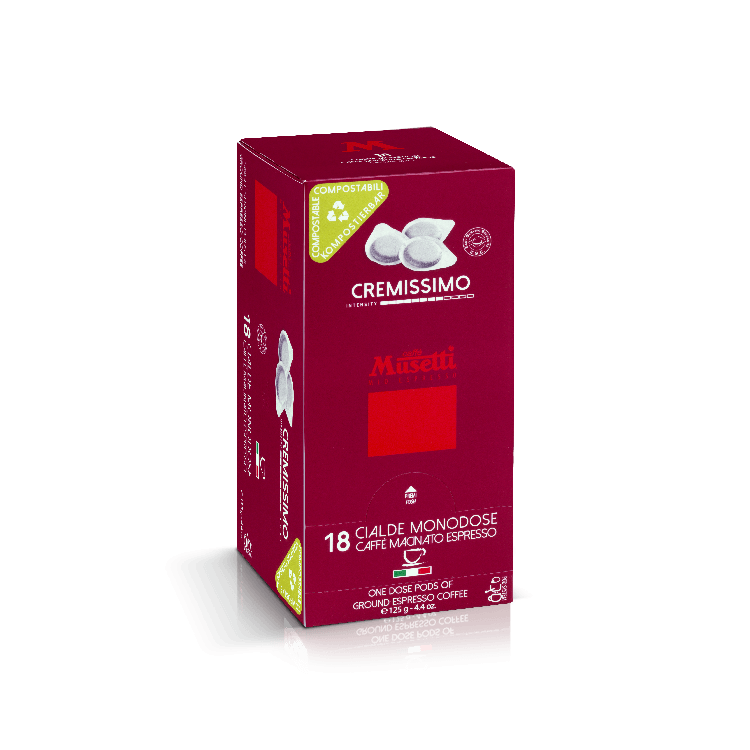 Cremissimo coffee pods, a full-bodied and creamy blend with intense and balanced taste. 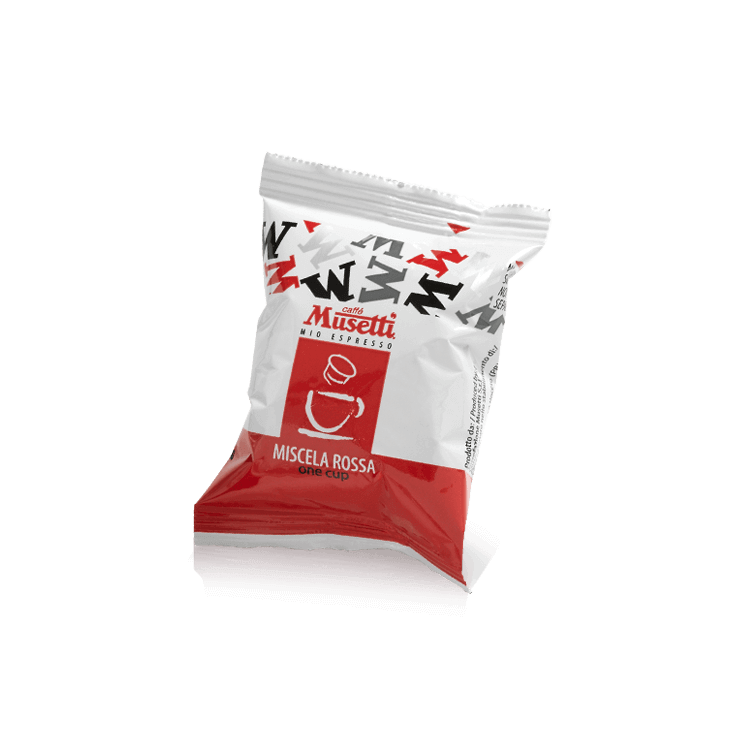 Rossa coffee pods, a great classic blend with intense and strong body and persistent aftertaste. 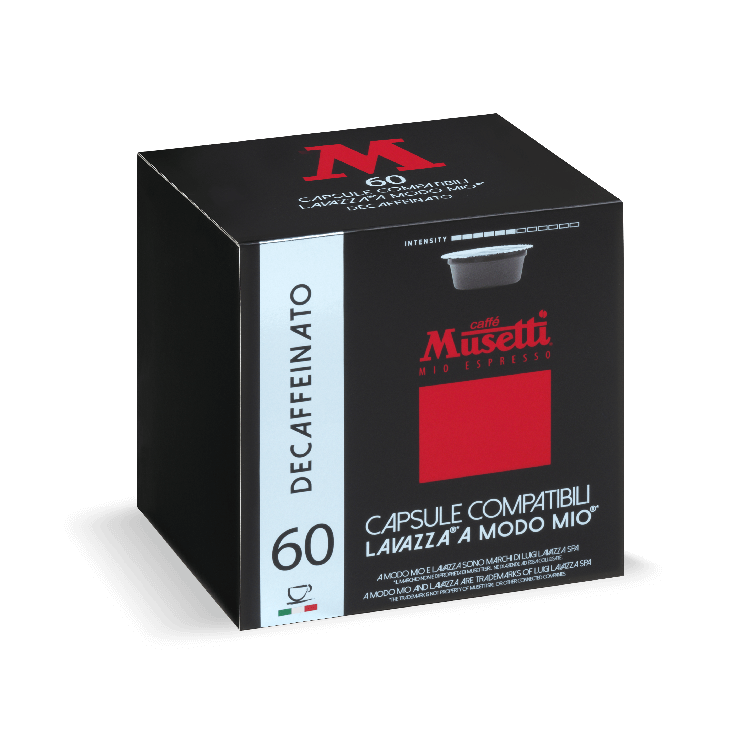 Decaffeinated coffee pods, full-flavored coffee with less than 0,1% caffeine content. 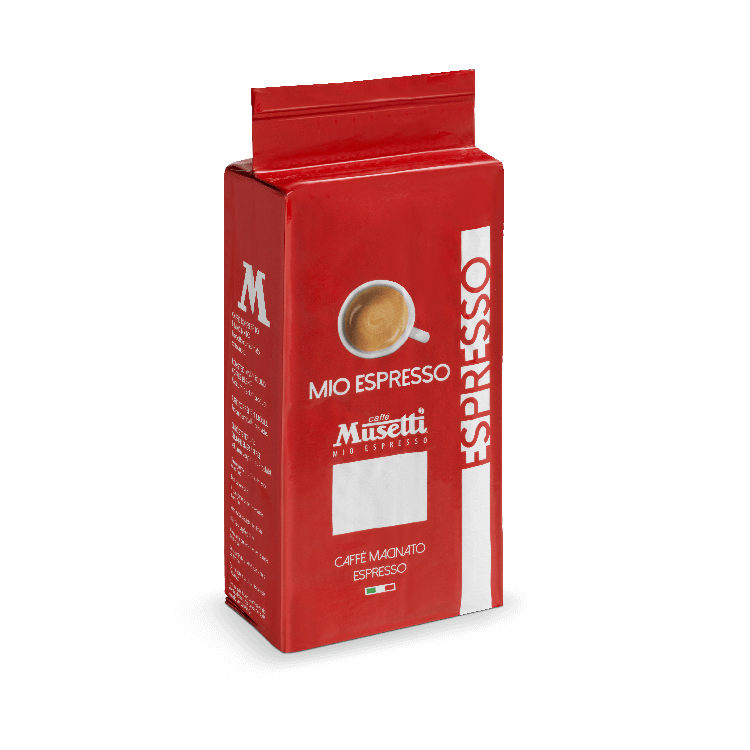 Sweet and light aroma. 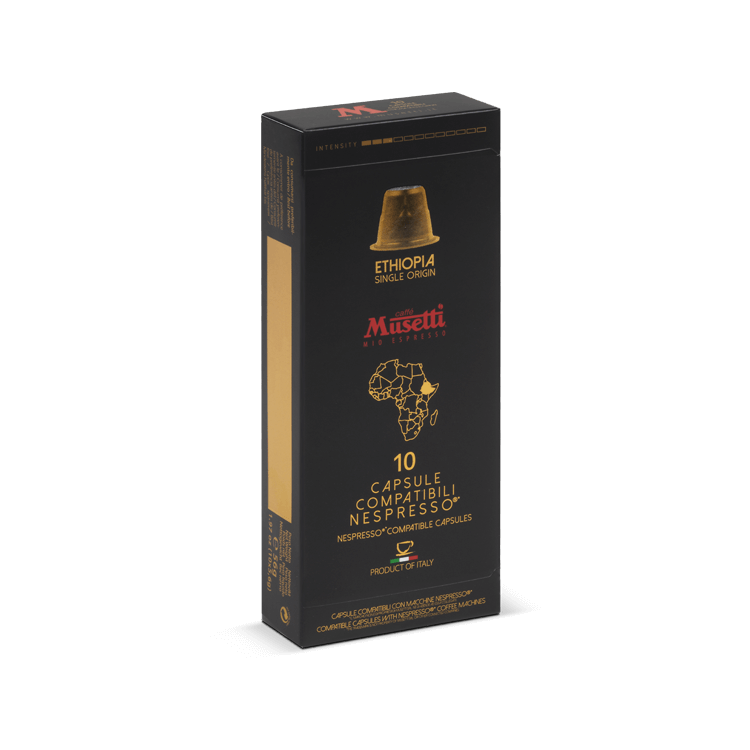 Ground Coffee Single Origin Kenya, a high quality, full bodied and fine acid blend. 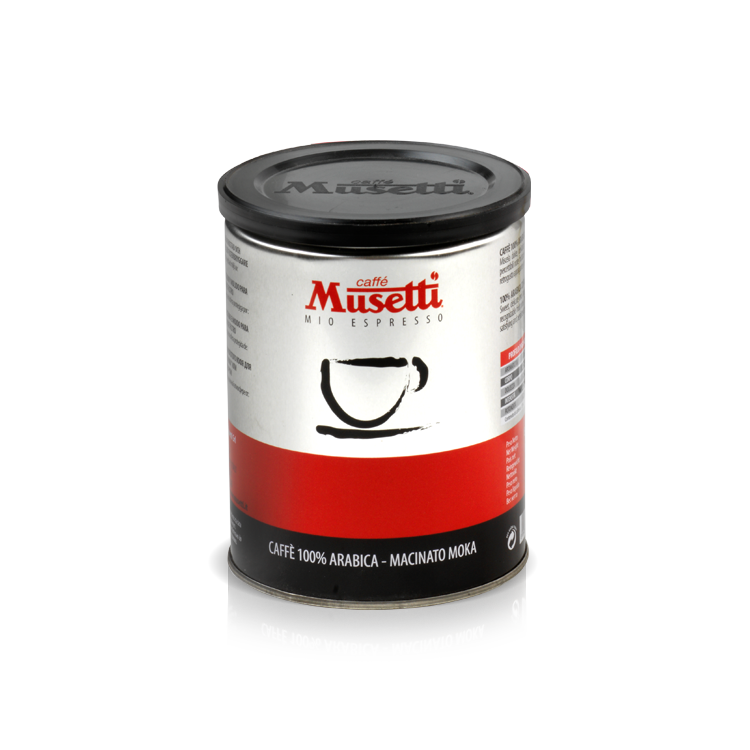 Ground Coffee Single Origin Brasile, a full and velvety bodied blend with intense and consistent aroma. 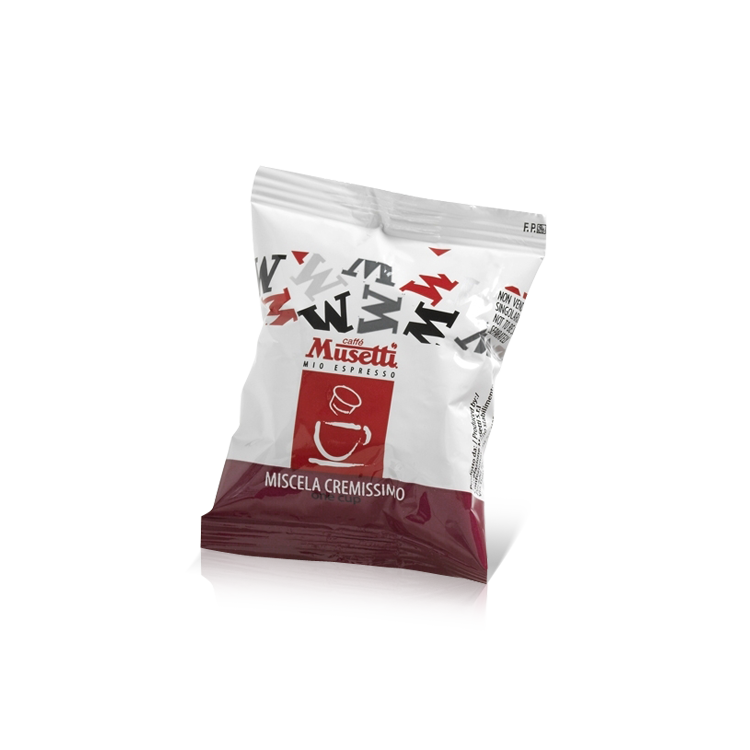 Ground Coffee Single Origin Ethiopia, a grand cru blend with complex and highly intense aroma. 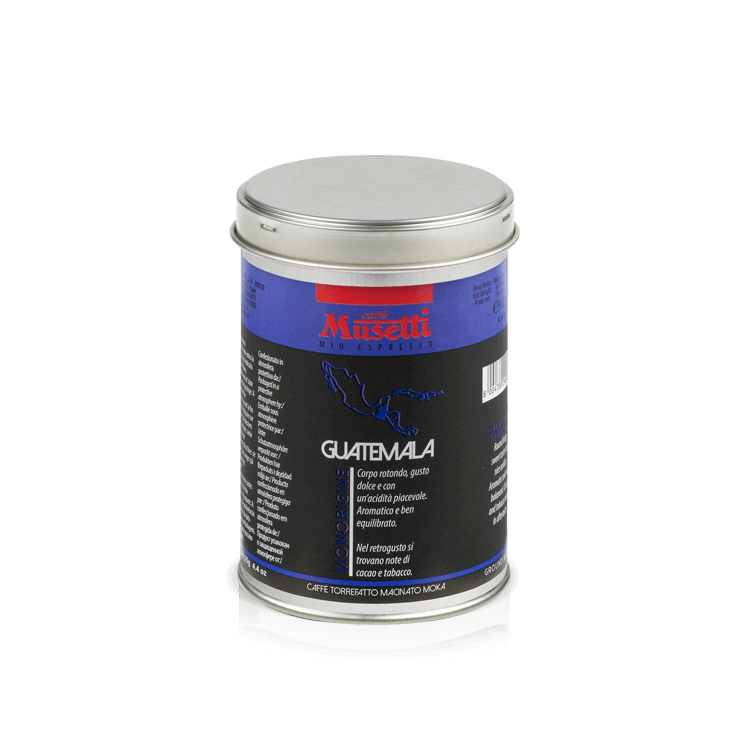 Ground Coffee Single Origin Guatemala, a full bodied, fineacid and sweet and aromatic flavoured blend. 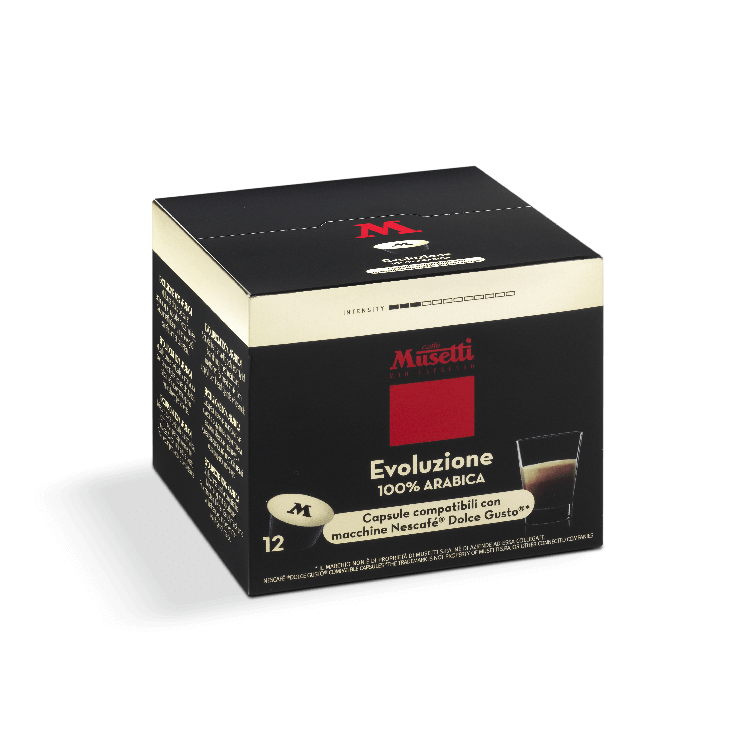 Ground Coffee Evoluzione, a sweet and mild acid blend from100% Arabica finest quality coffees. 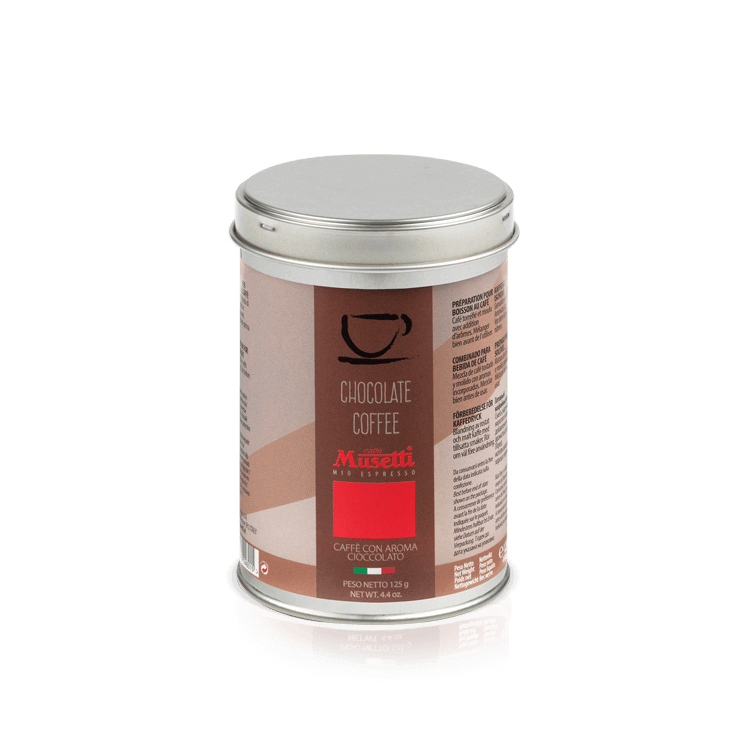 ‘Midori’ organic ground coffee, a sweet and smooth organic blend with fine acidity. 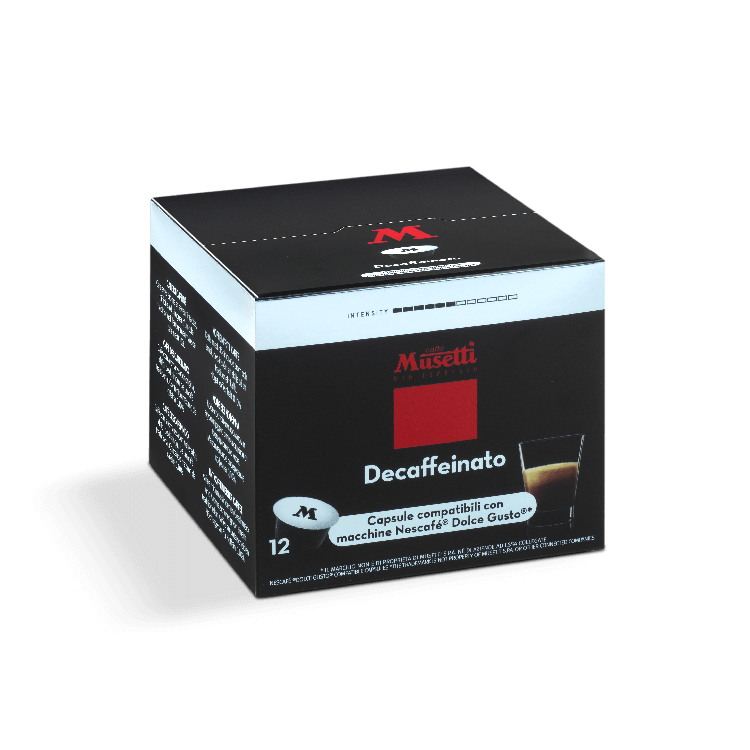 Decaffeinated ground coffee, full-flavored coffee with less than 0,1% caffeine content. 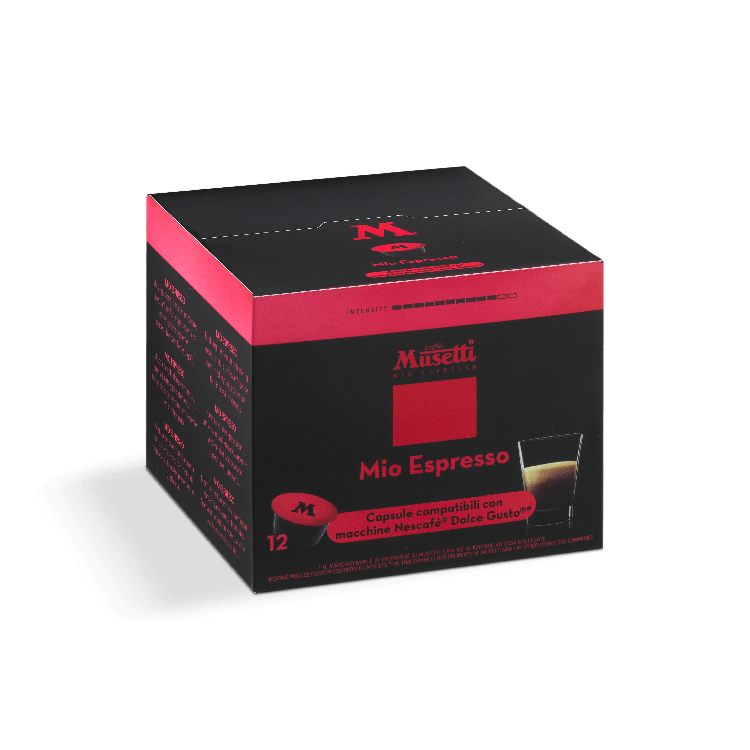 Sweet and light aroma. 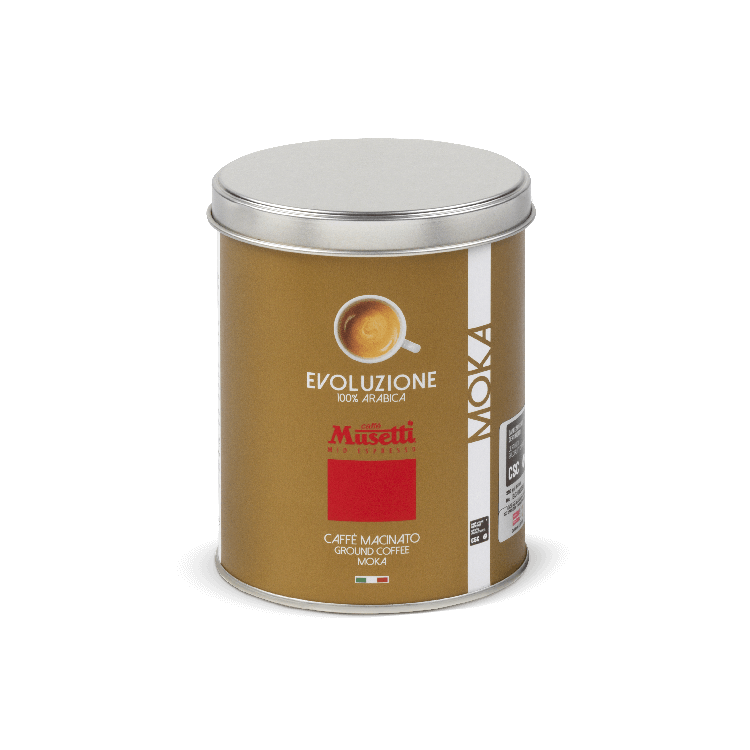 Ground Coffee Evoluzione old edition, a sweet and mild acid blend from100% Arabica finest quality coffees. 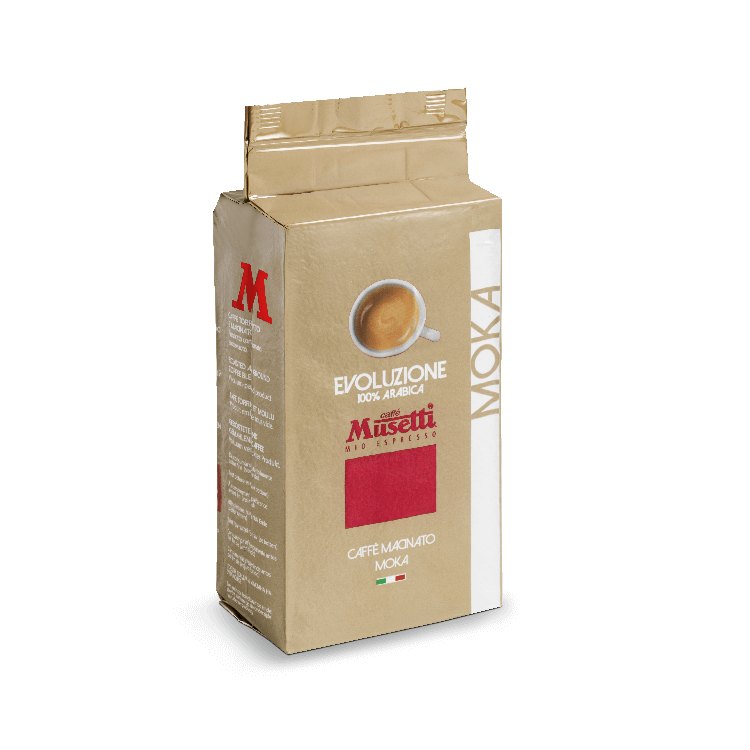 Evoluzione old edition ground coffee, a sweet and mild acid blend from 100% Arabica finest quality coffees. Rossa ground coffee, a great classic blend with intense and strong body and persistent aftertaste. 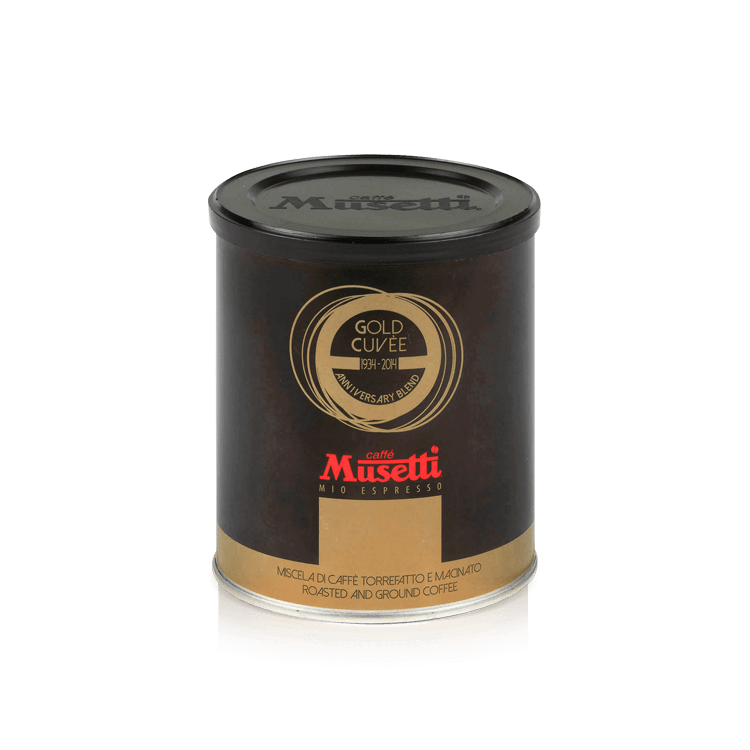 Gold Cuvée ground Coffee from finest quality coffees, a sweet, richly flavored and fine acid blend. Vanilla flavored ground coffee, a coffee blend combined with the sweet vanilla aroma. Amaretto flavored ground coffee, a coffee blend combined with Amaretto intense aroma. 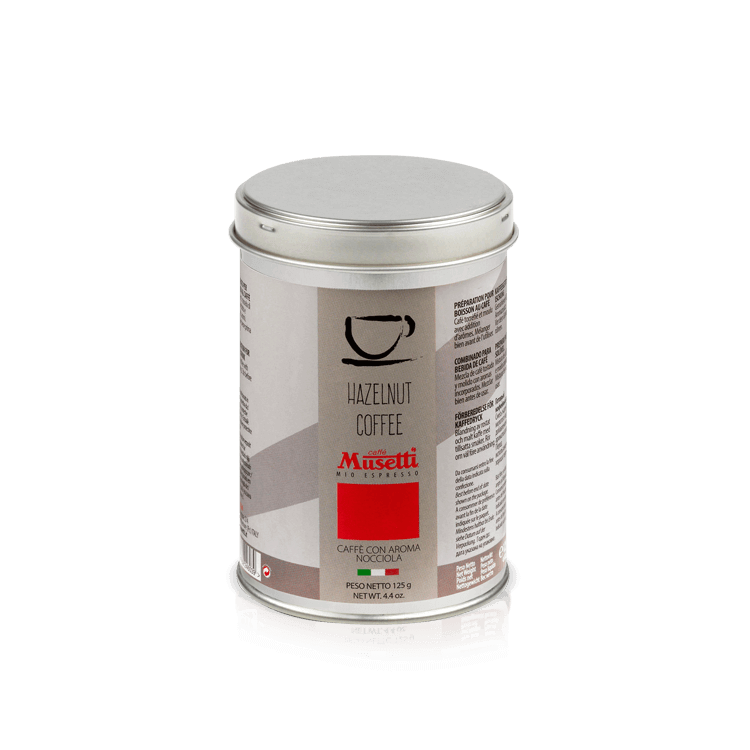 Hazelnut flavored ground coffee, a coffee blend combined with the excellent hazelnut aroma. 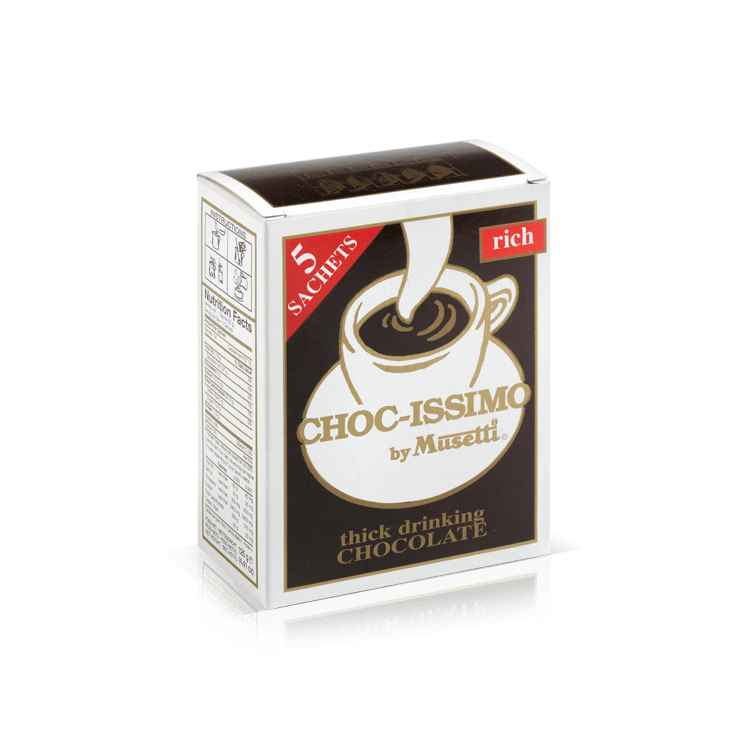 Chocolate flavored ground coffee, a coffee blend combined with the enveloping cocoa notes. Irish coffee flavored ground coffee, a coffee blend combined with the strong Irish Coffee aroma. 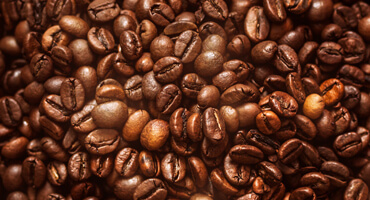 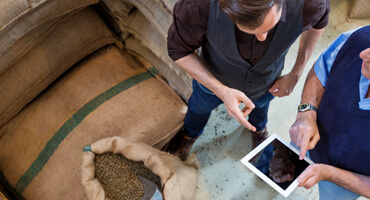 Fair Trade ground coffee, a good coffee blend not just in taste. 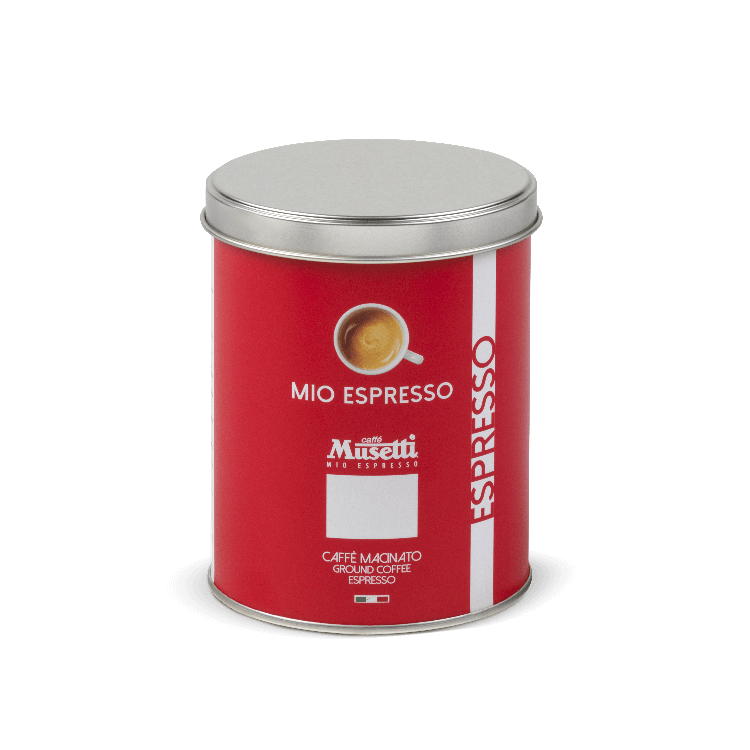 Intense aroma and strong flavor. 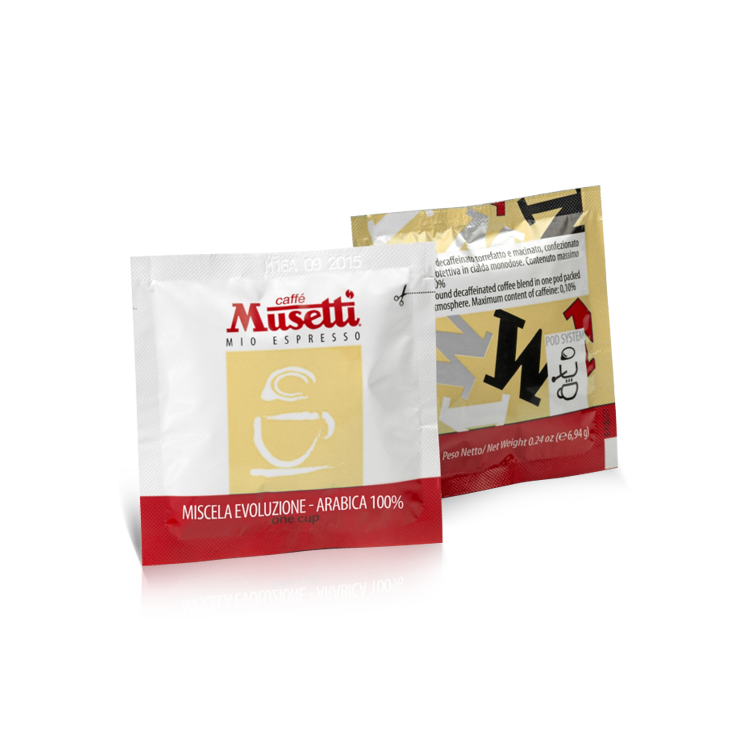 Rossa coffee capsules, a great classic blend with intense and strong body and persistent aftertaste. 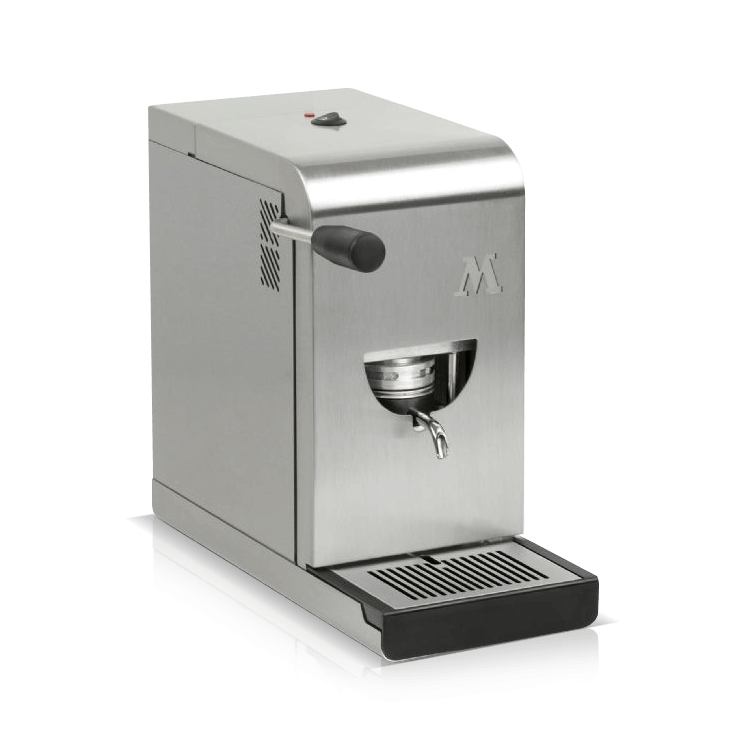 Coffee Pods machine Mitica, compact size espresso machine, to enjoy a good coffee. 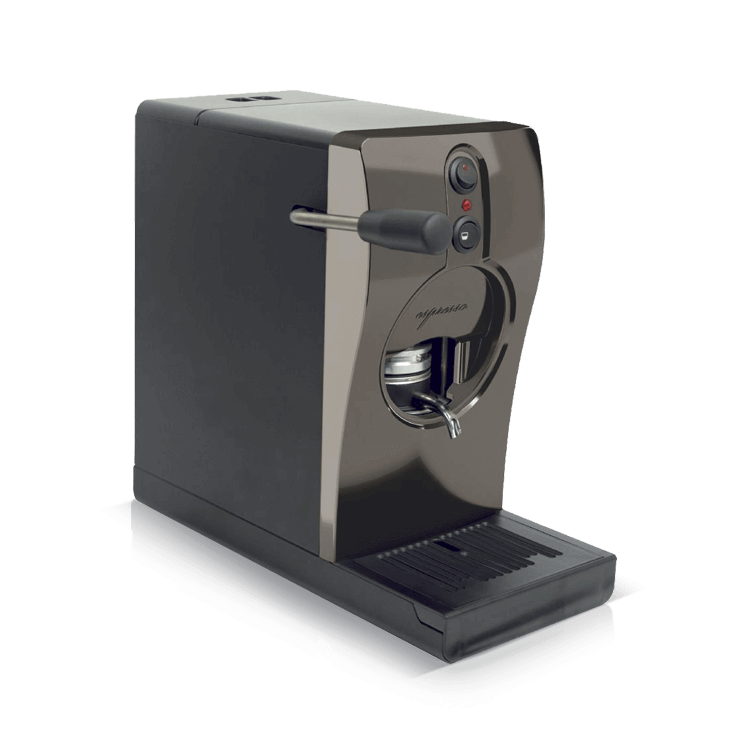 Pod Coffee machine Tube Nichel, innovative technology and design, easy to use and compact size espresso machine. 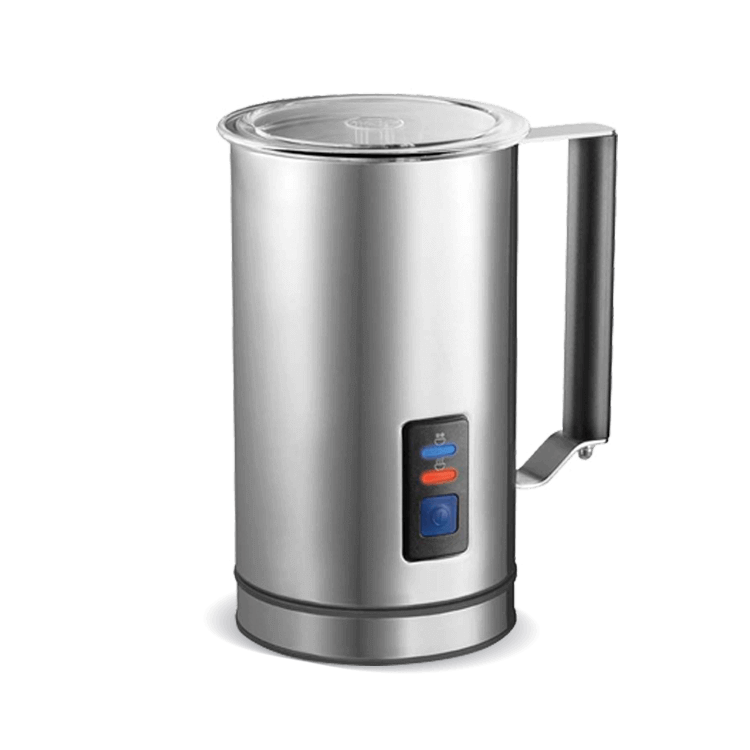 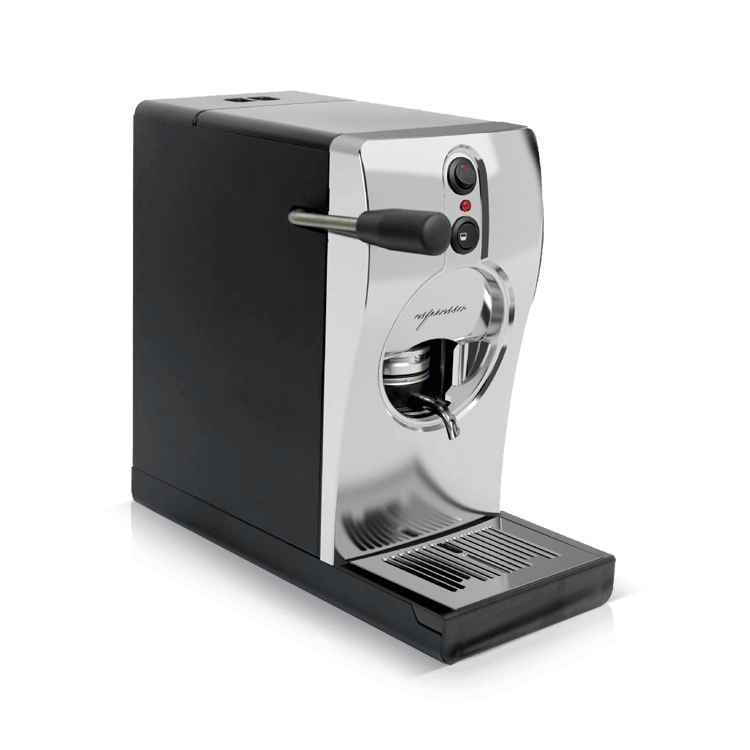 Pod Coffee machine Tube Chrome, innovative technology and design, easy to use and compact size espresso machine. 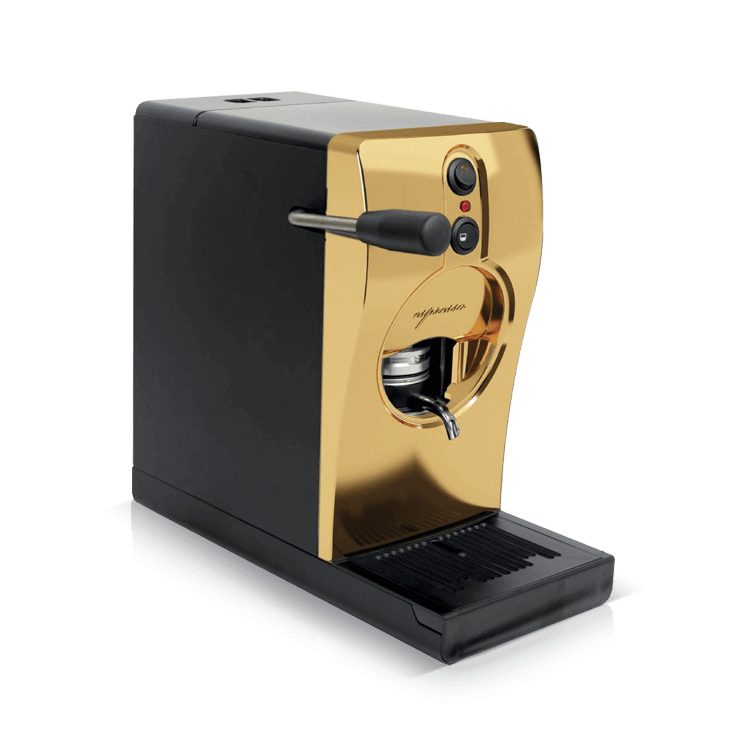 Pod Coffee machine Tube Gold, innovative technology and design, easy to use and compact size espresso machine. 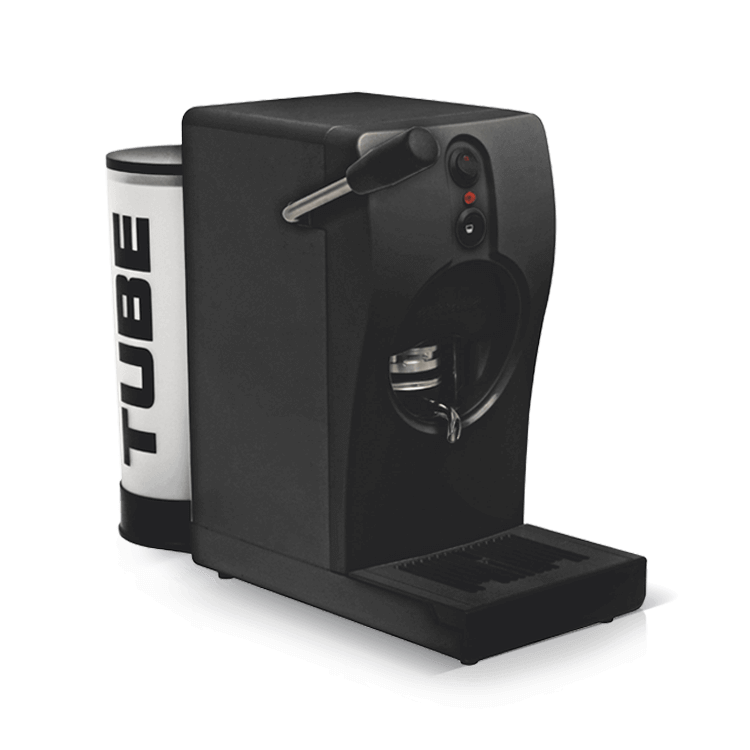 Pod Coffee machine Tube Black, innovative technology and design, easy to use and compact size espresso machine. 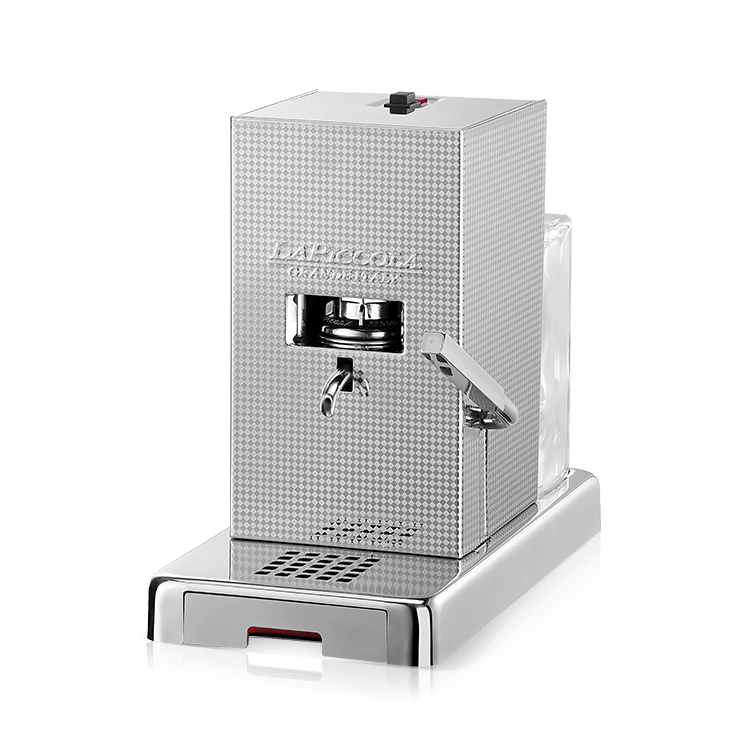 Pod Coffee machine La Piccola Piccola Pearl, the first-rate and the least bulky coffee machine on the market. Pod Coffee machine La Piccola Piccola Gold, the first-rate and the least bulky coffee machine on the market. 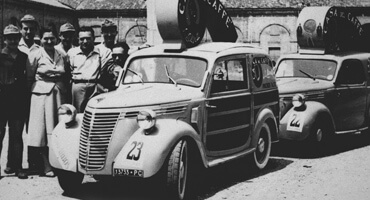 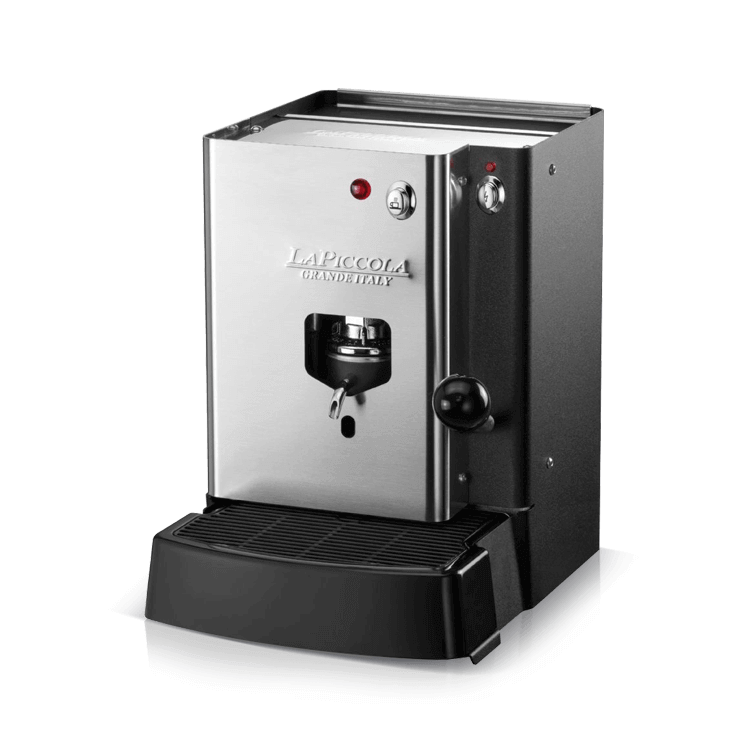 Pod Coffee machine La Piccola Piccola&Piccola, the first-rate and the least bulky coffee machine on the market. Pod Coffee machine La Piccola Sara Steam function, milk frothier and steam wand included. 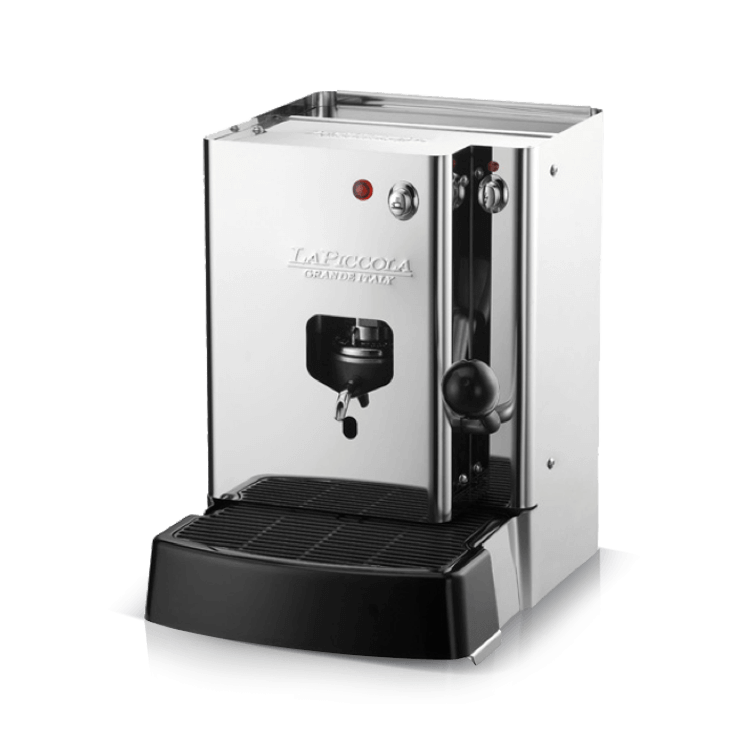 Pod Coffee machine La Piccola Sara Steel, easy to use, small, compact and fast espresso machine. 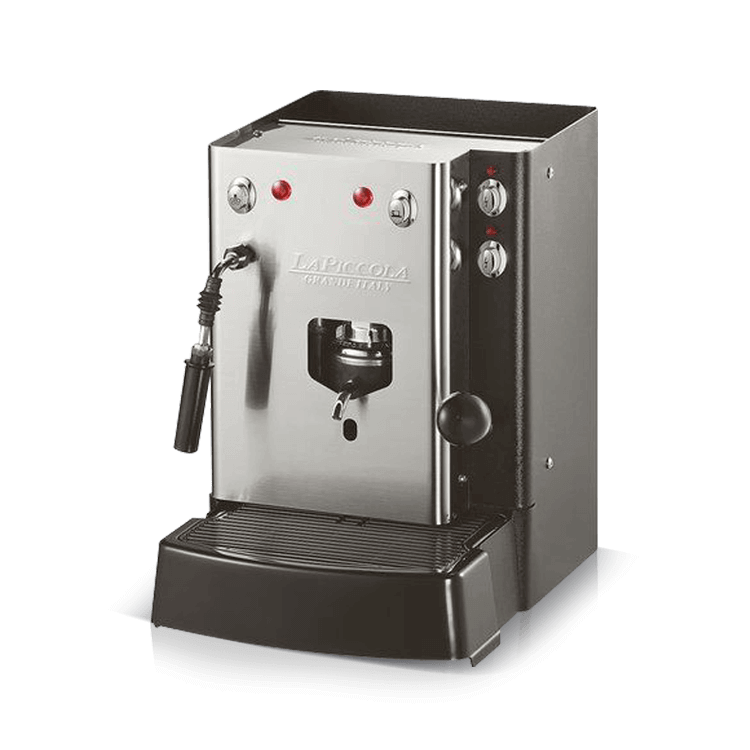 Pod Coffee machine La Piccola Sara, easy of use, small, compact and fast espresso machine. 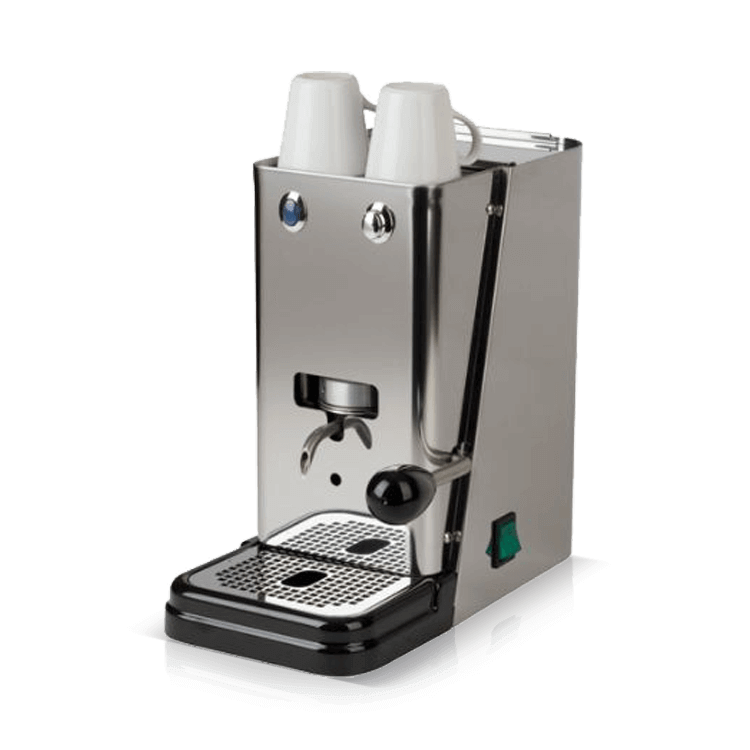 Pod Coffee machine ZIP FLYTEK, home espresso machine, small size, 100% Made in Italy. 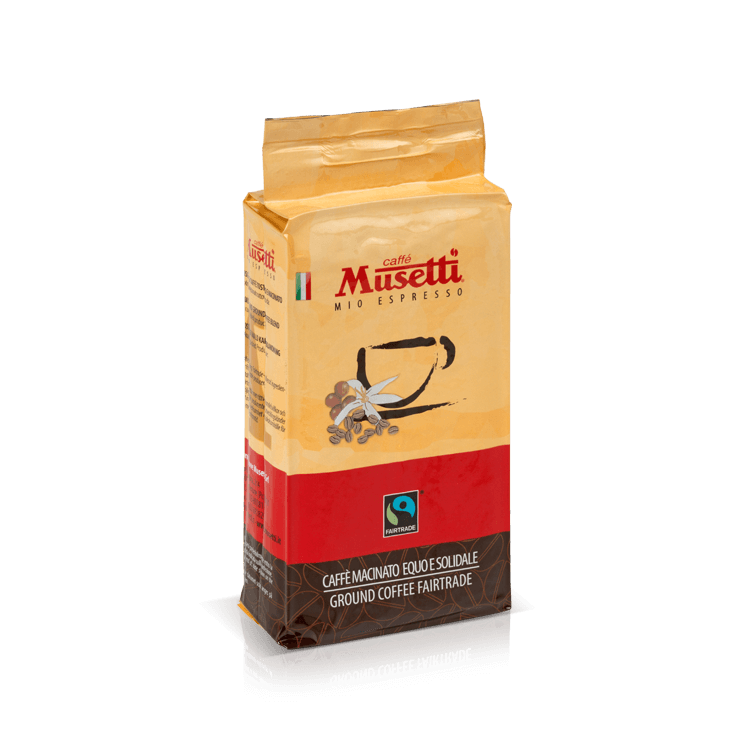 Milk frothier La Piccola, exclusive, for a perfect cappuccino frothed in few minutes. 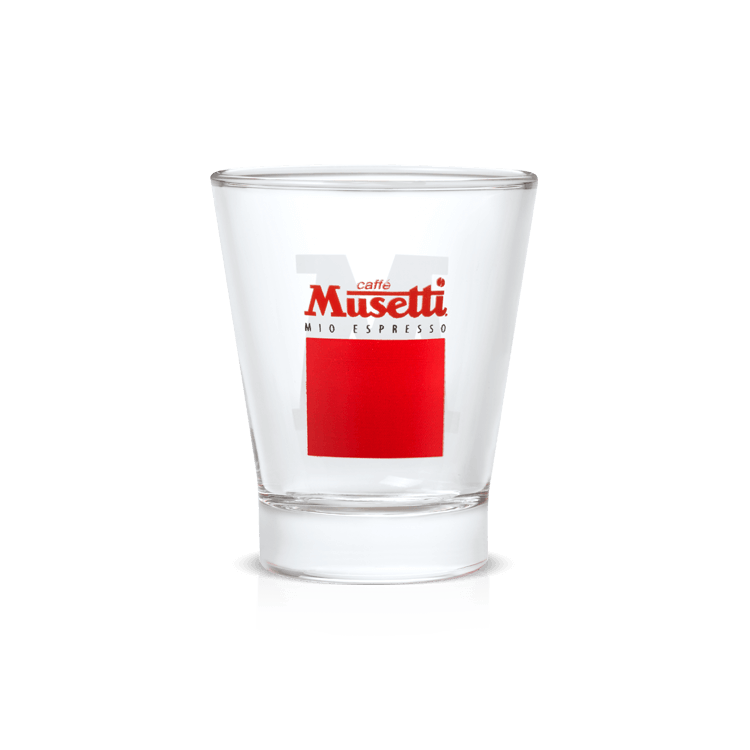 Coffee glass “Musetti” - perfect for aromatic coffees and coffee creams. 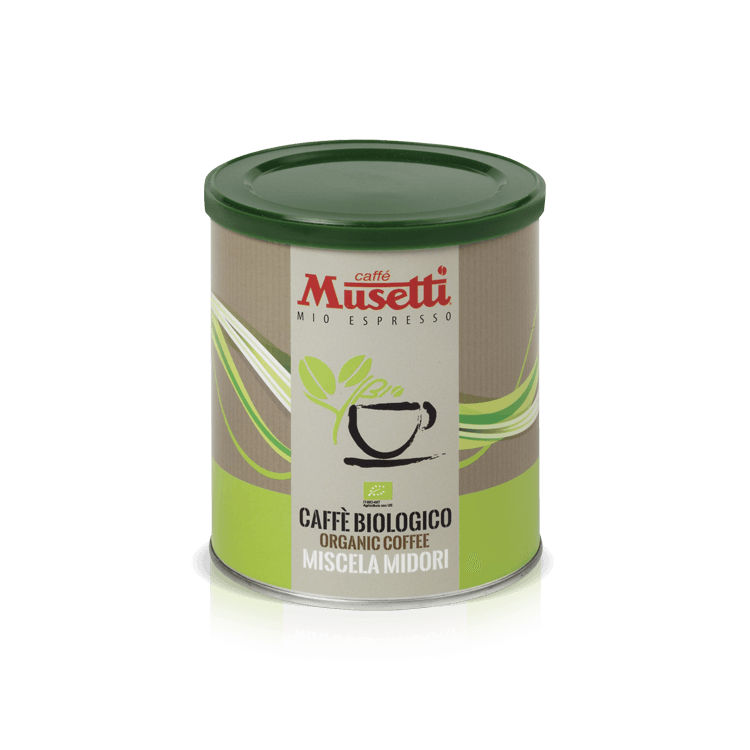 Organic Coffee Cups 6 pcs. 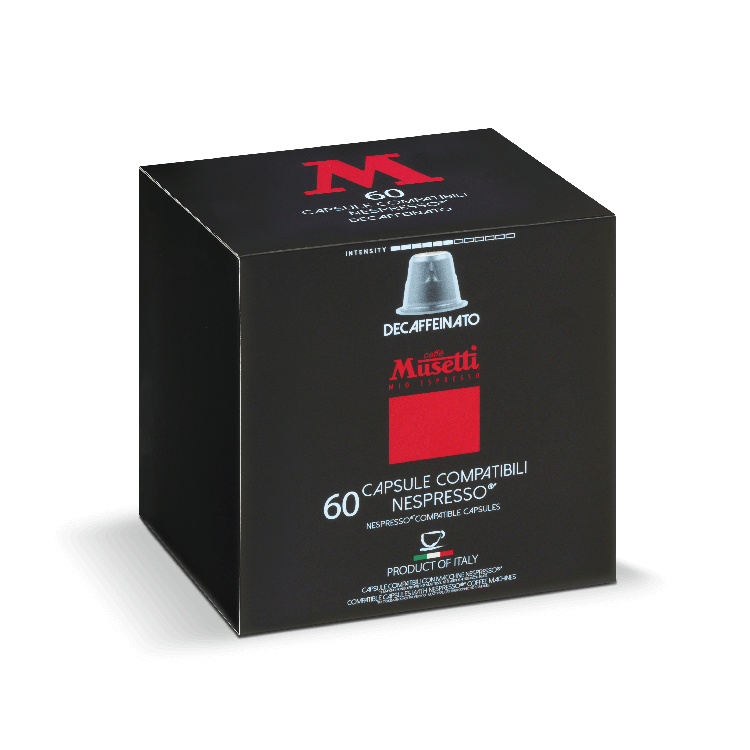 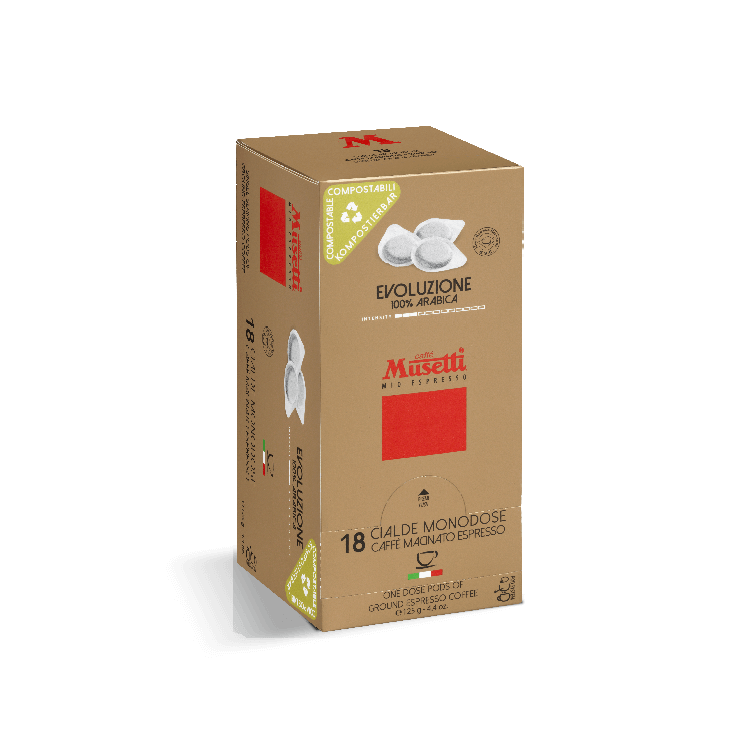 Bio Cups Collection “Parigi’’ - Musetti coffee quality combined with Bioagricert certification. 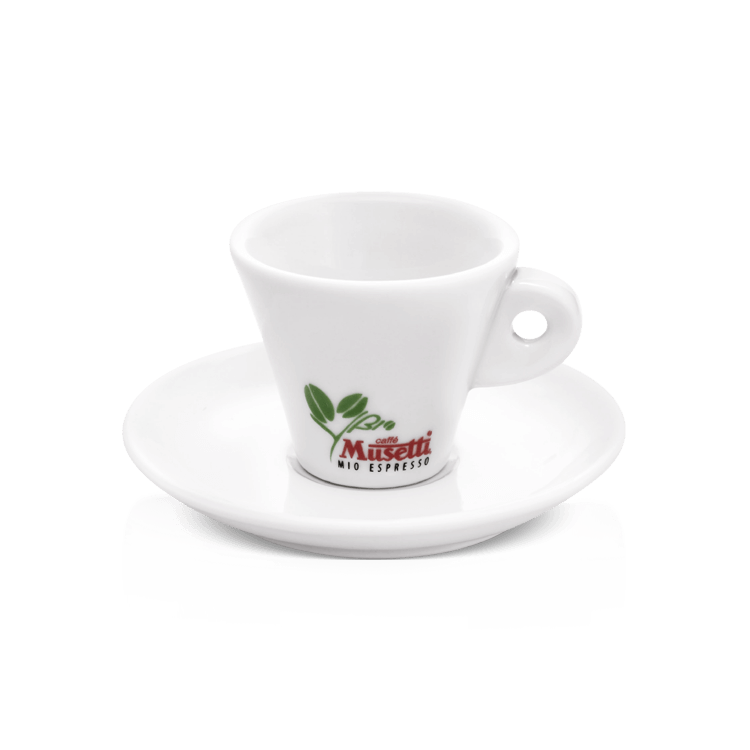 Coffee Cups Collection Parigi 6 pcs. 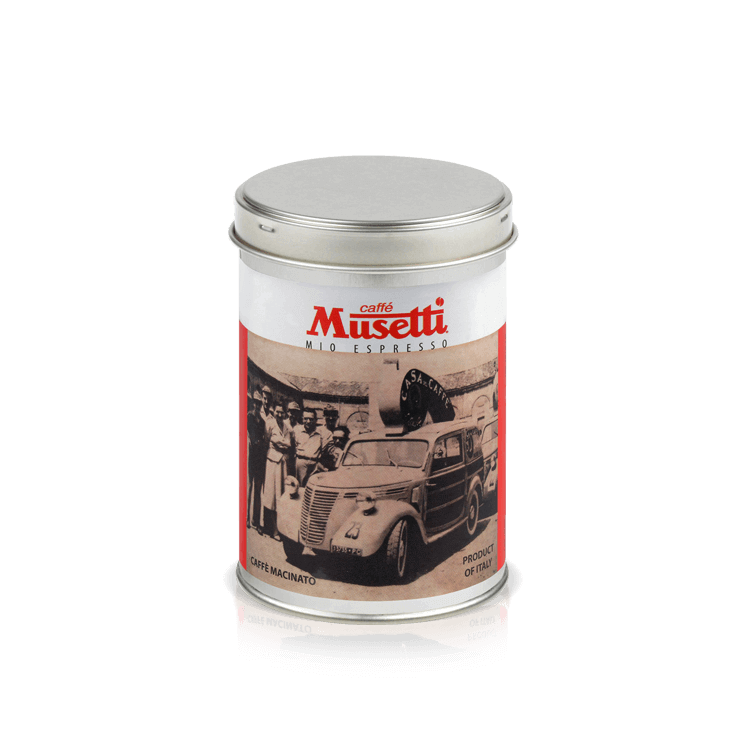 Cups Collection “Parigi” - designed to preserve the cream and enhance the coffee aftertaste. 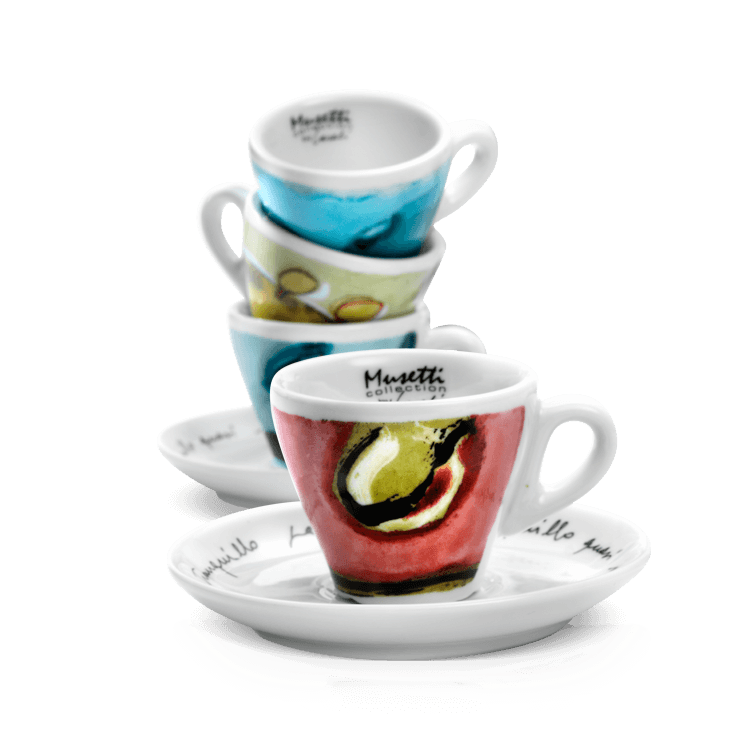 Coffee Cups Collection Paesaggio 6 pcs. 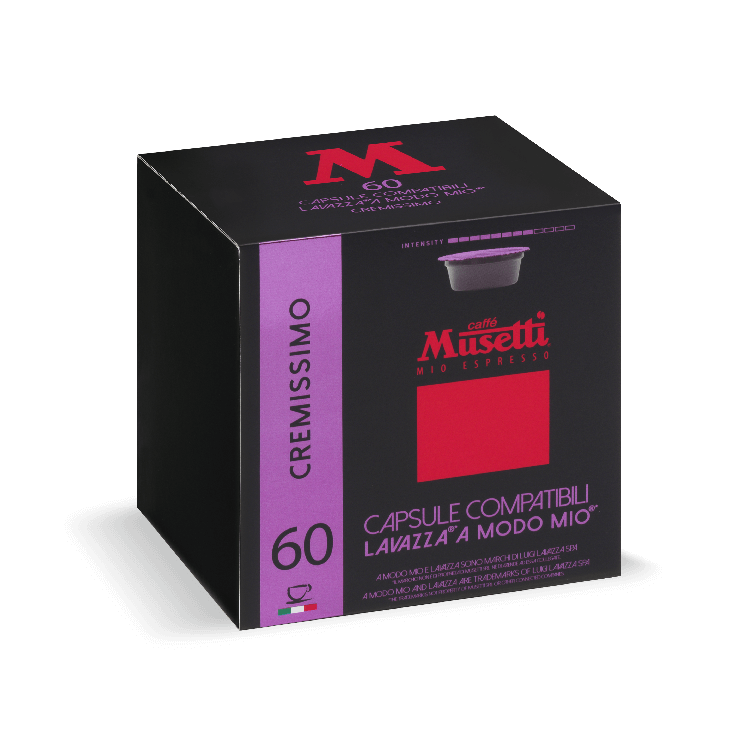 Cups Collection “Paesaggio”, the ceramics enlivened by the impressive and quiet hills around Piacenza. 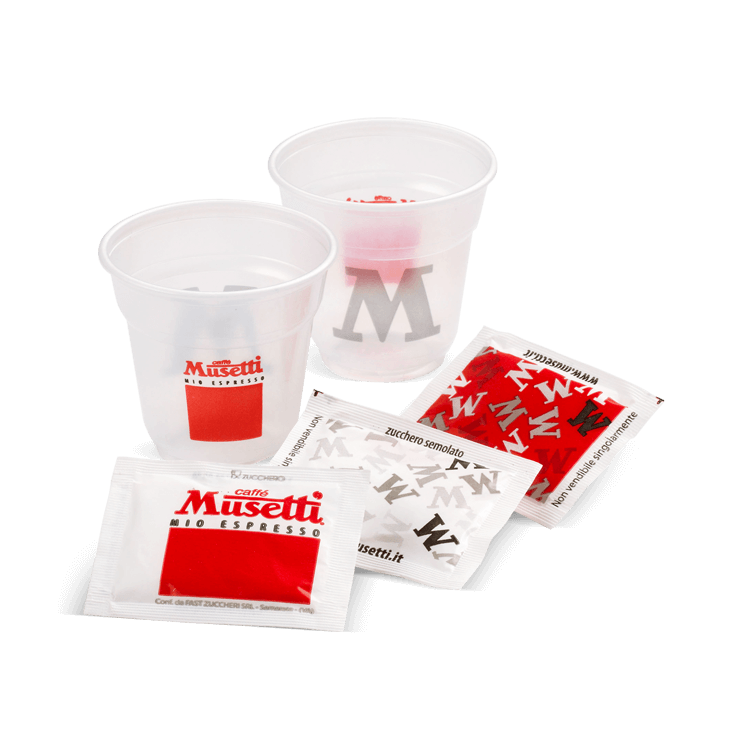 Coffee Cups Collection the Senses 6 pcs. 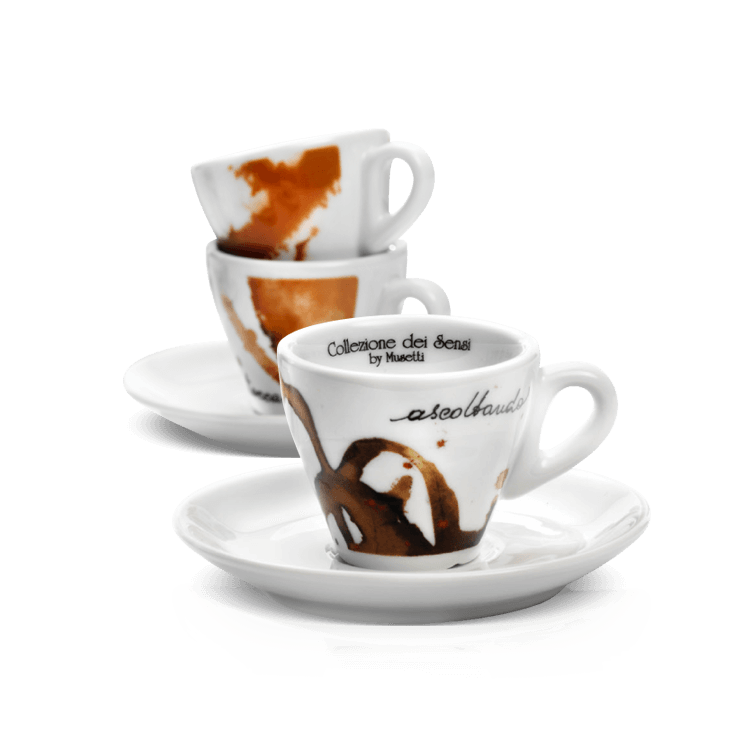 Cups Collection “Sensi” - coffee drops creating a charming interplay of solids and voids. 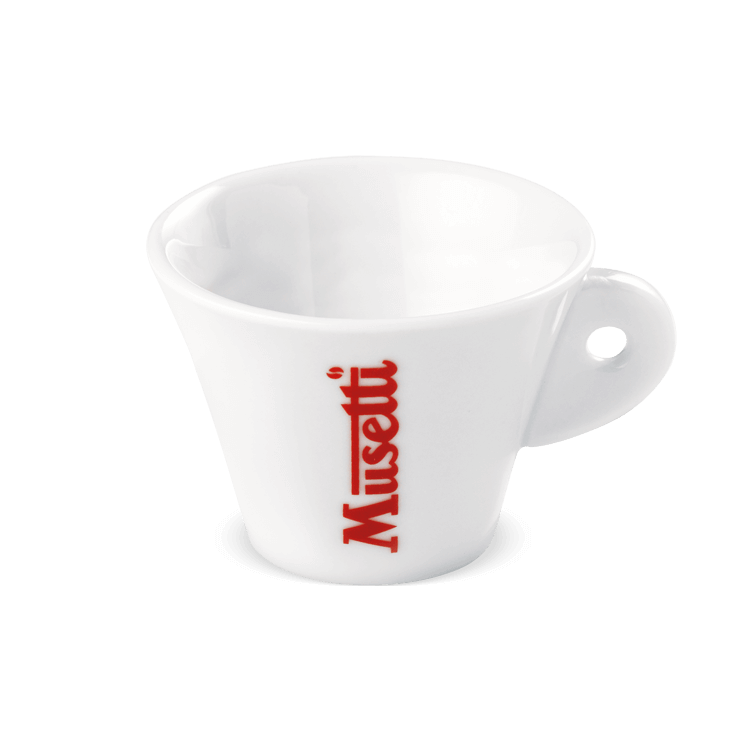 Sugar Bowl “Parigi”- matching the cups, can be displayed and used to personalize your coffee shop. 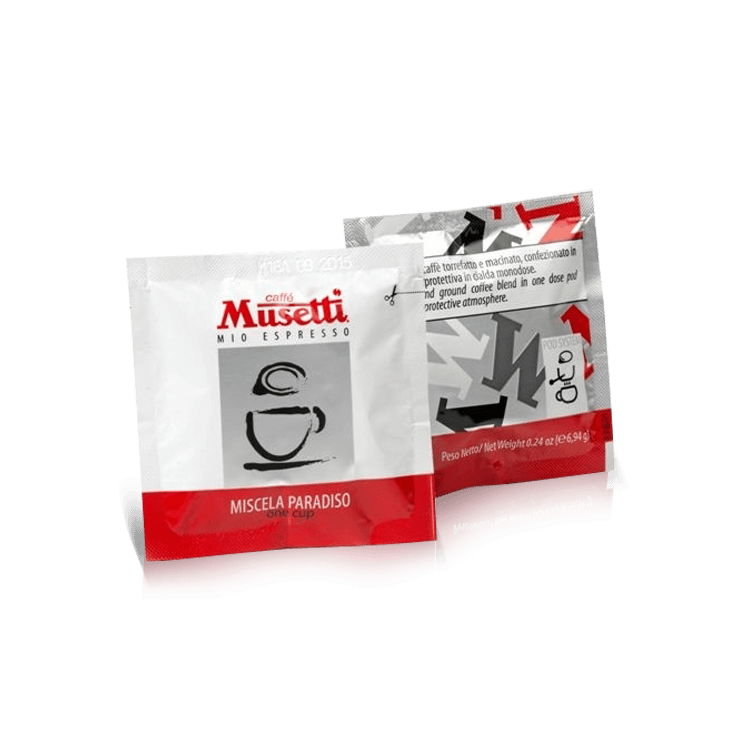 Sugar Pods Kit: all you need to enjoy a good coffee. 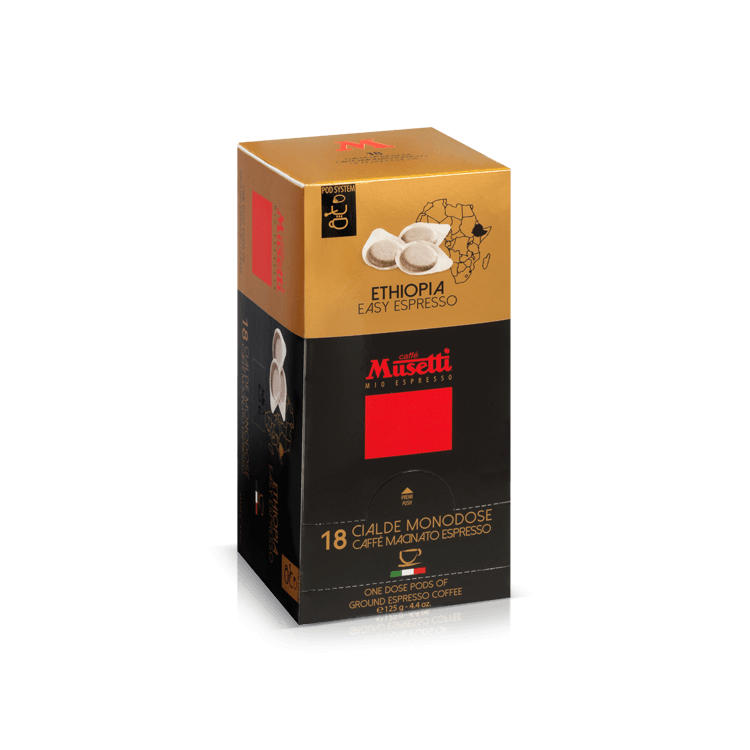 Chocolate-covered treats: Arabica coffee beans coated with the best dark chocolate to enjoy your espresso. 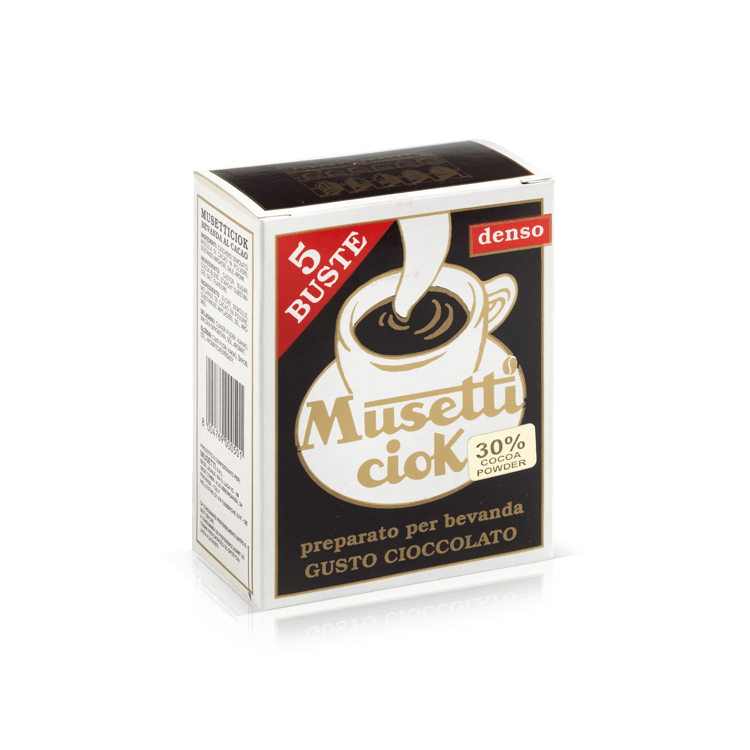 Musetti Ciok, hot chocolate mix, warming up winter afternoons. 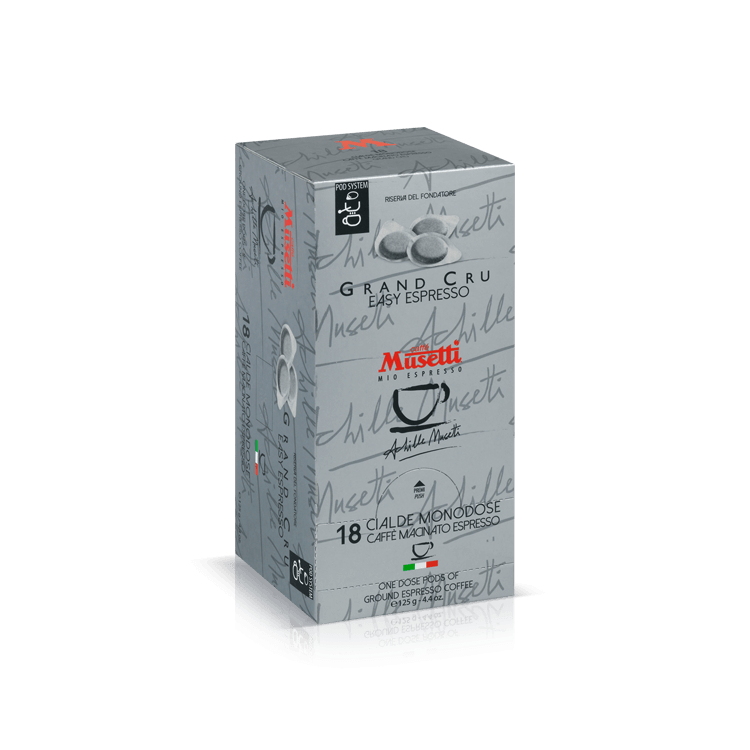 Today Tea, a blend of the best Ceylon teas, to enjoy your own warm rest.